We’ve been in Ireland for about 19 days now checking out some sights alone and with Mark’s sister, Julia for 10 of those days. Mark and Susan got a few extra days because a lovely winter storm decided to show its head in Colorado on our scheduled departure date (the bomb cyclone of snow and high winds). We proactively called United and convinced them to let us change the tickets with the same exact routing to 2 days early. 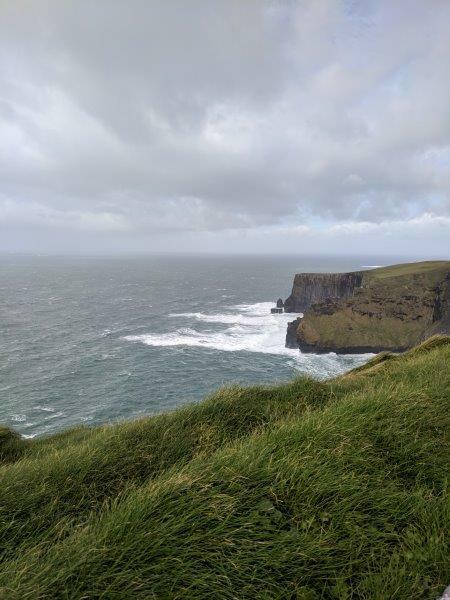 I must have been super nice because they agreed – we packed, left the next day and spent 2 extra days in Dublin, arriving just in time for a winter wind and rain storm. Julia arrived on March 15 and the adventure began with overnights at Navan, Liscannor, Killarney, Kilkenny, and Dublin. High winds and rain continue! 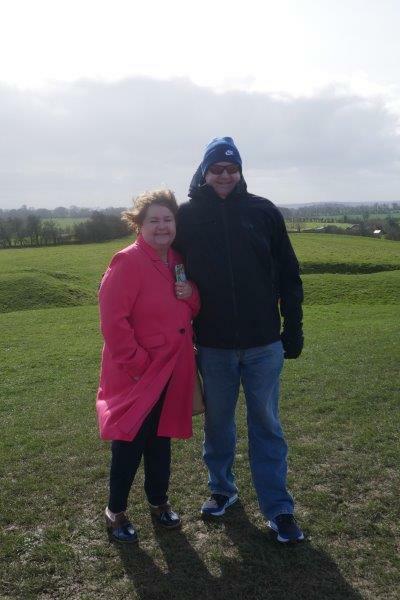 You can tell how windy it was at the Hill of Tara. This was the end of the winter storm in Ireland. 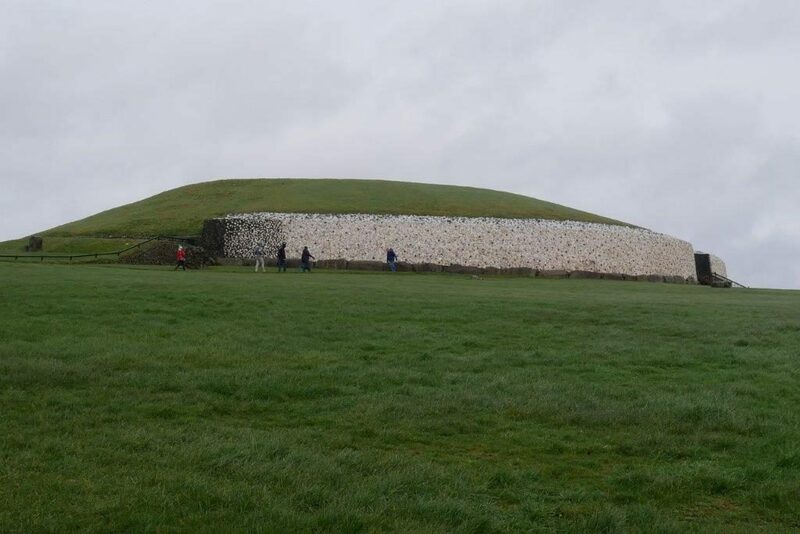 Burial passages at Newgrange. The rain poured down here while we listened to the tour guide. We were glad to be the first group in the passage because the rain had mostly stopped by the time we came out. Wind was blowing straight into my face. It was bit chilly! 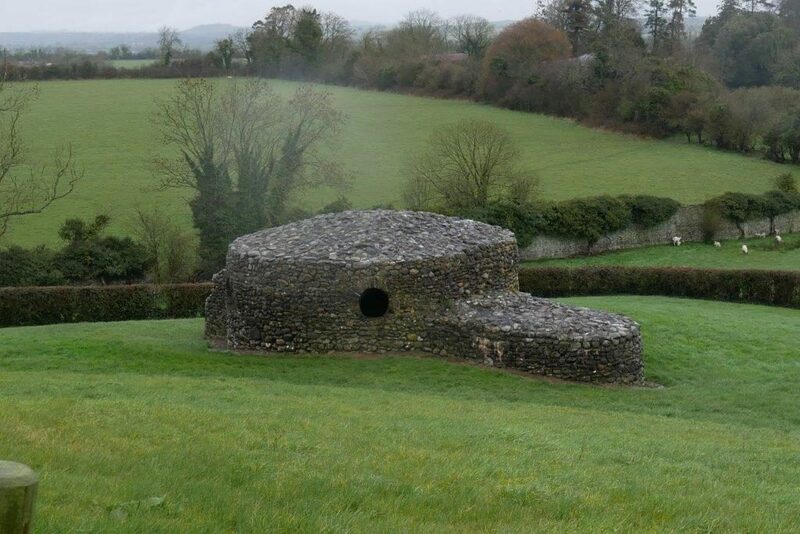 Part of Newgrange. You can see why Ireland is called the Emerald Isle – caused by copious quantities of rain including the rain drop on the camera lens. Mark drove while Susan navigated, and Julia enjoyed the scenery from the backseat. 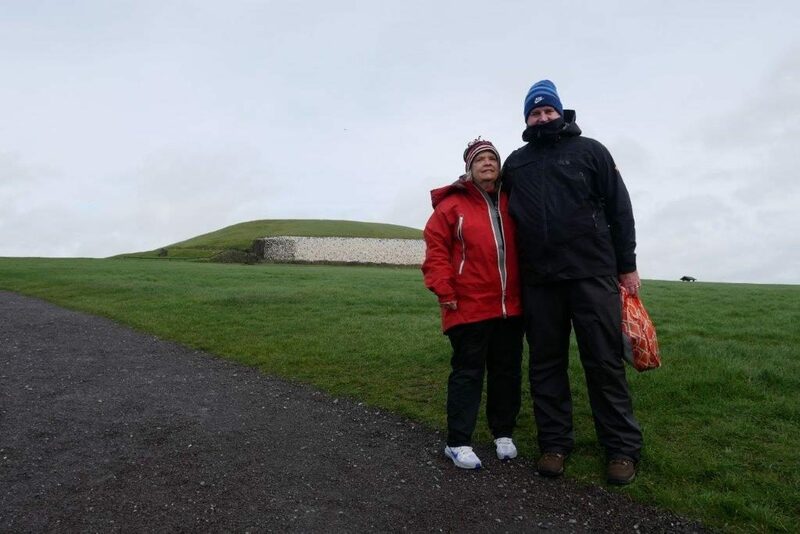 We visited Newgrange in a downpour and the Cliffs of Moher in 40 mph winds. 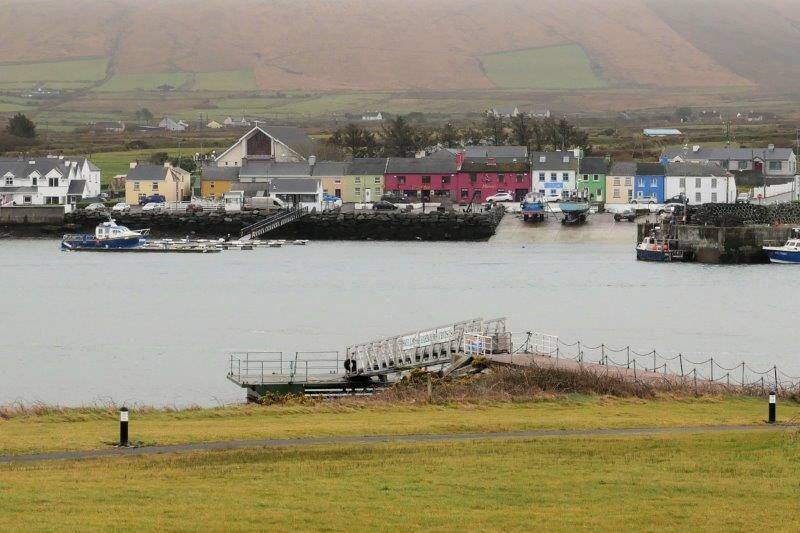 The rest of the days were typical spring weather – grey, cloudy, off and on rains. 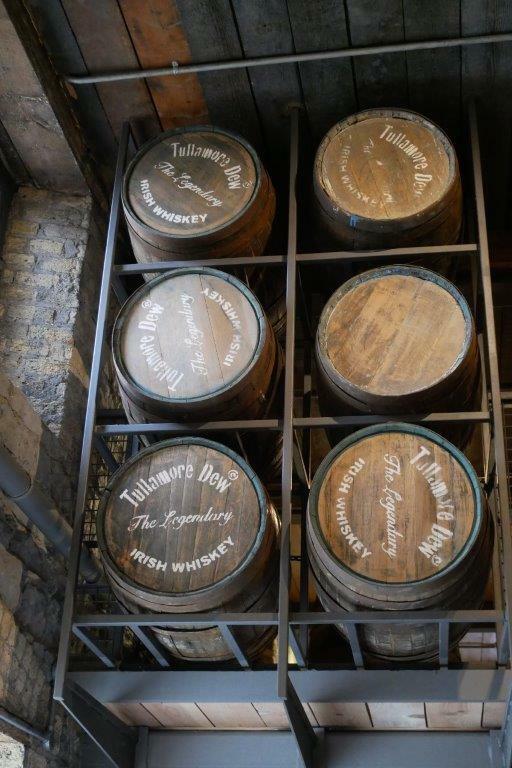 On the drive from Navan to Liscannor (north of Dublin across the country to County Clare in the west), we stopped in Tullamore to tour the Tullamore Whiskey distillery. Google maps had a problem with this one. It got us close but put us on the opposite side of the canal from the factory on a one way street (we think) with no parking. Old fashioned direction guessing led us to a city parking lot by the distillery. 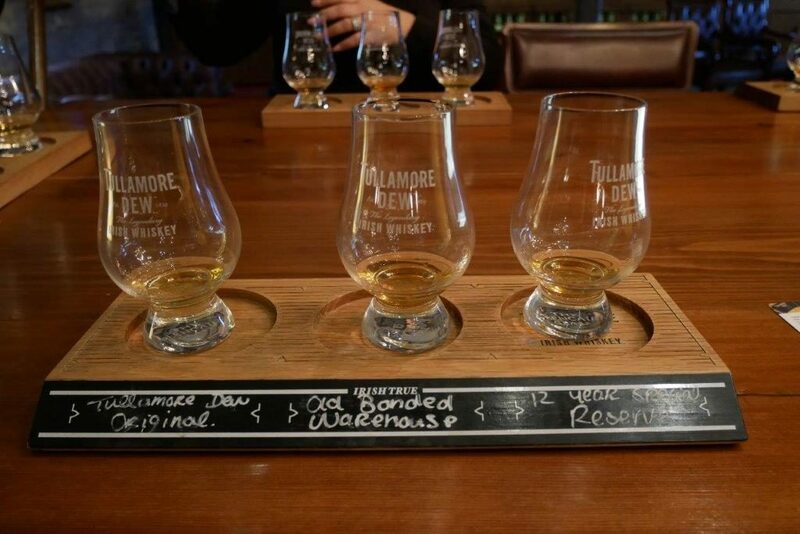 What distillery tour would be complete with a tasting? Liscannor is a TINY village on the west close to Cliffs of Moher. 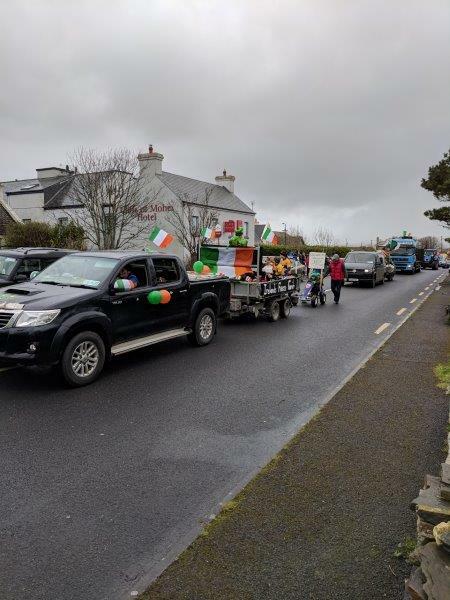 Every village has a parade on St. Patrick’s Day, including this one – 10 minutes long. 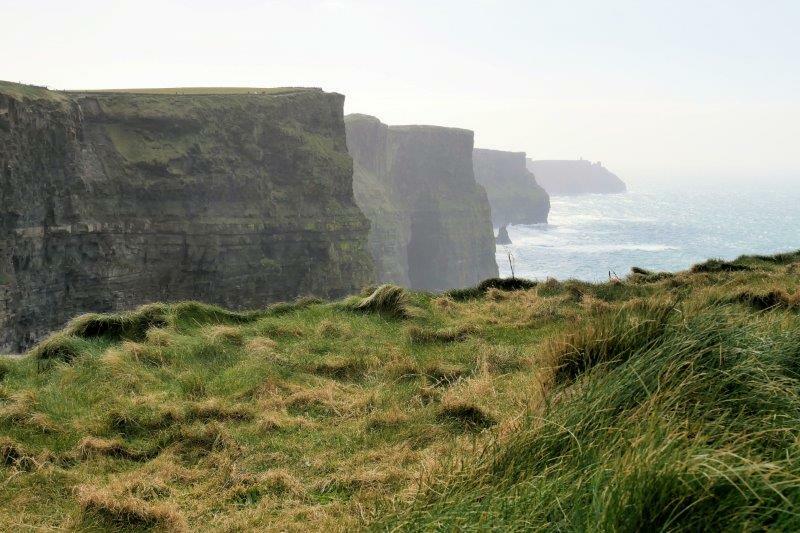 It’s also close to the Cliffs of Moher and makes a great location for exploring the area. 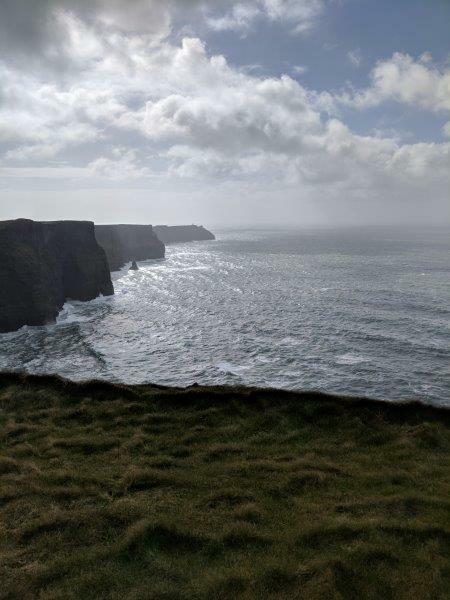 View of the Cliffs of Moher. The wind blew about 40 mph while we were there, making the walking less than ideal. When the weather is better, a path goes along the cliffs for miles. Everyone bundled up for this excursion. The wind was howling! 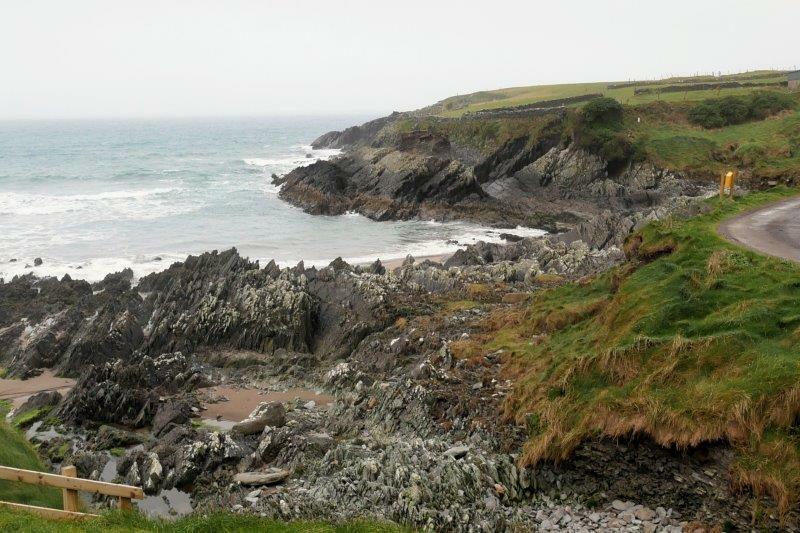 Ring of Kerry drive. This drive took most of the day even in low season. We can’t imagine doing this one in the summer with all the tour buses fighting for parking space along the way. 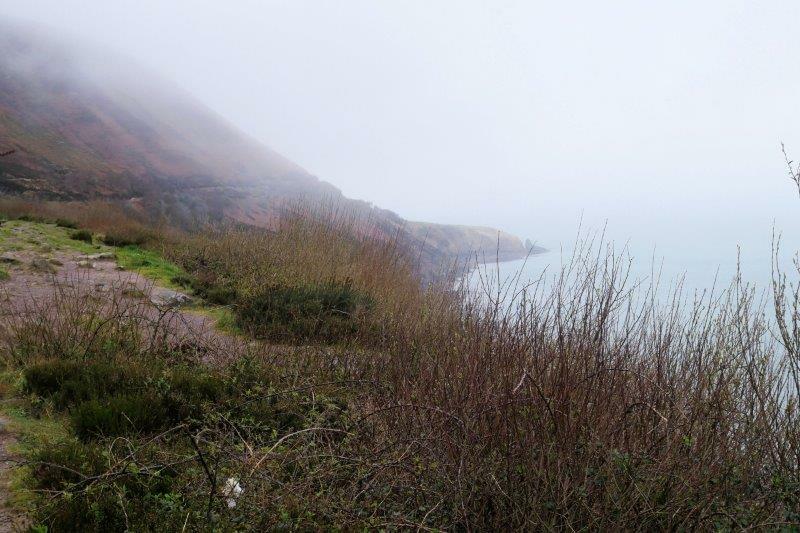 The fog rolled in and out all day long along the Ring of Kerry. The Skellig Ring is a peninsula off the Ring of Kerry. We made a stop at the Visitor Centre for a toilet and this picture of the harbor. Sheep everywhere! It is lambing season and the babies are pretty cute! 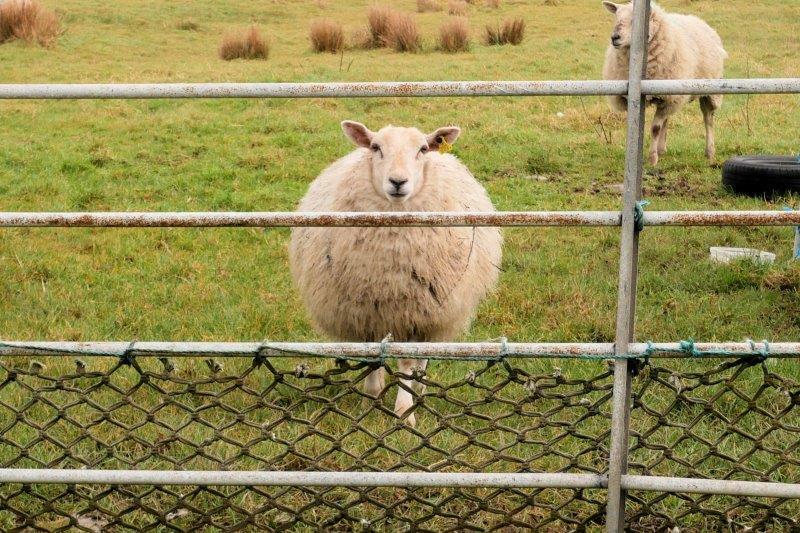 This sheep was very interested in us. 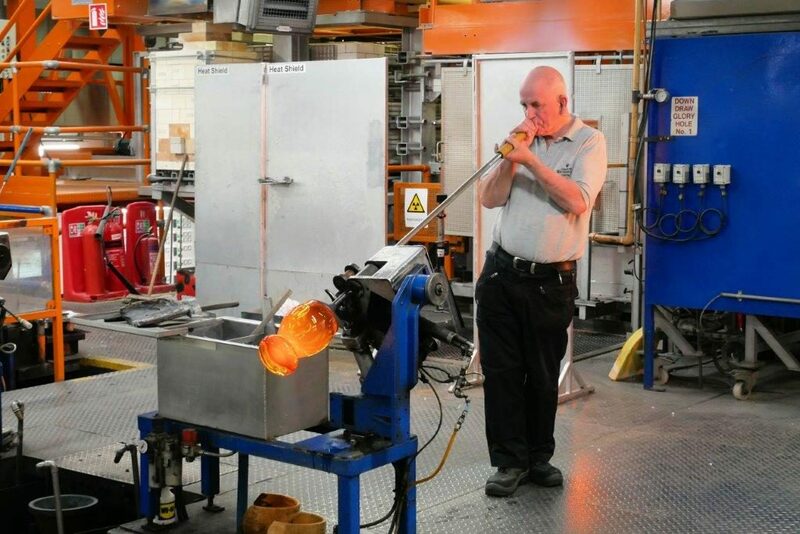 Julia wanted to visit the Waterford factory. When we visited before, the plant was on the outside of town. Now it’s in the middle of Waterford! We honestly thought we were in the wrong place. The tour is good; like all good tours it ends in the gift shop. They will be happy to ship your purchases home for you! One of many ruins we found along the way. 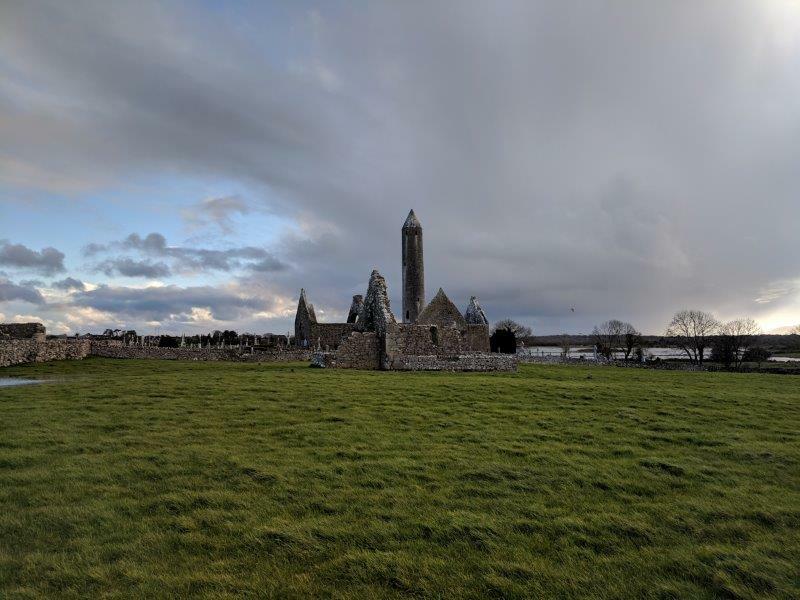 This one is from the 8th century – a collection of churches and a round tower where the monks took refuge when they were attacked. 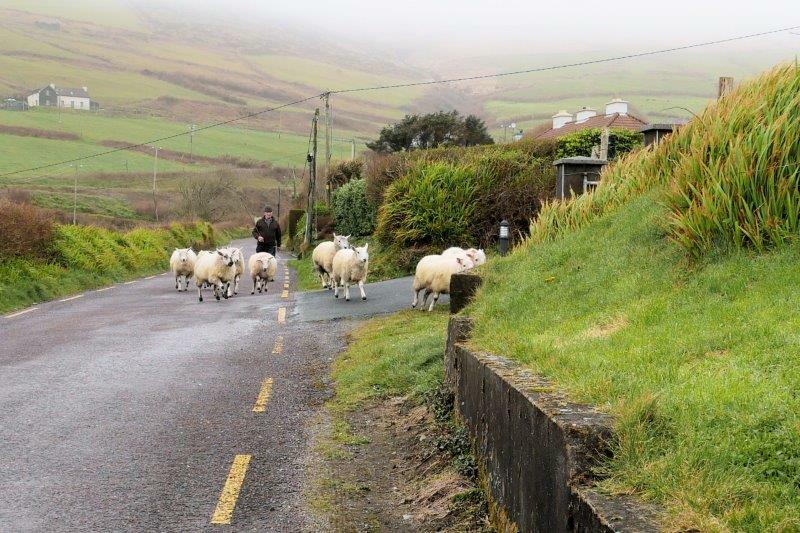 We spent St. Patrick’s Day in Liscannor along the west coast in County Clare. They had a parade like the rest of the country. When your population is about 100, the parade only lasts about 10 minutes. 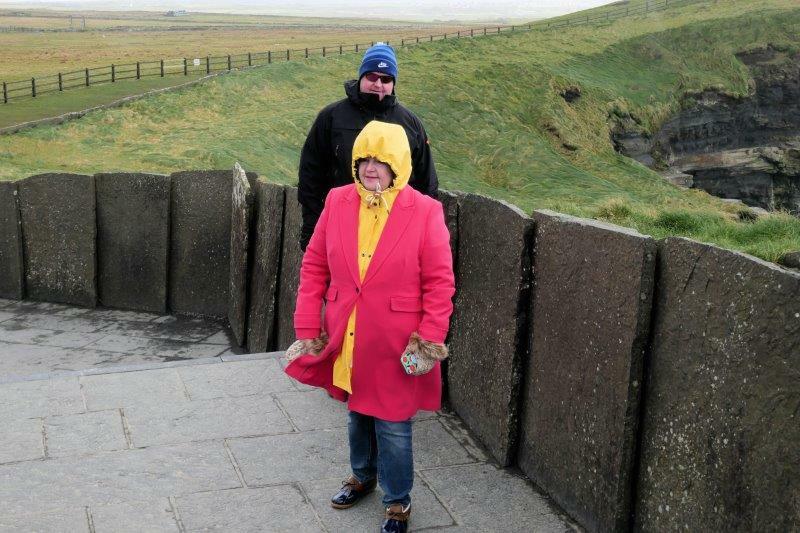 After the parade, we drove to Cliffs of Moher where the wind was whipping at about 40 mph. 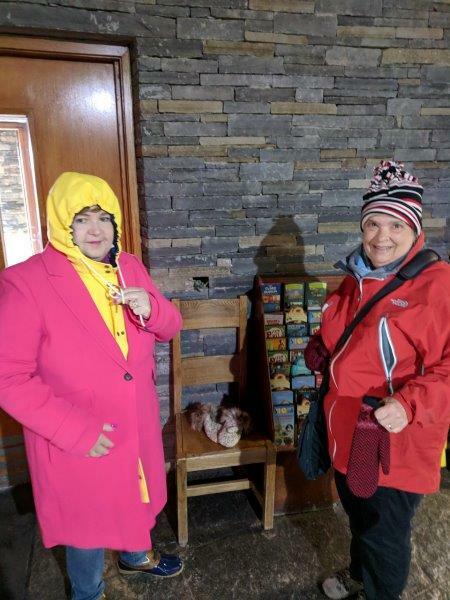 Julia and Susan (and everyone else) bundled up before venturing out to see the scenery. Mark took the pictures! More of the Cliffs of Moher. We drove from Liscannor to Killarney today on mainly good roads. It was a bank holiday so not much traffic. Surprise! 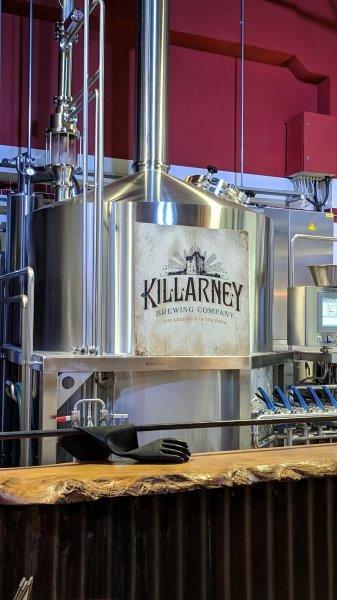 The Killarney Brewing Company was 4 buildings from our hotel so we HAD to try their beer! Great beer and we ran into a couple who had lived in FC when he worked for Anheuser-Busch. 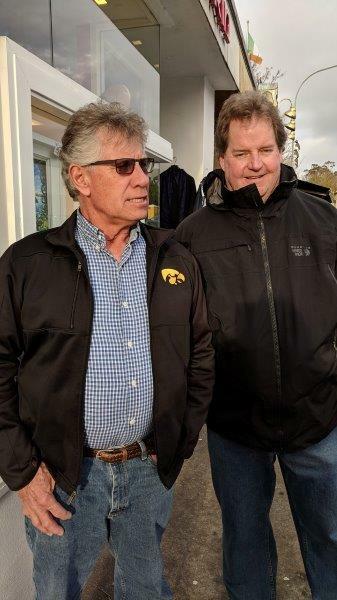 Hawkeyes are everywhere! This one was shopping in Killarney with his wife. Mark chatted with him while Julia shopped. I updated the Trip Statistics page so you can see our “lists” of everything. One of us loves to make lists! You might remember that Susan started buying, tasting and recording different potato chip flavors when she was in Bhutan. Who can resist “weird” flavors?? Here are 3 we found in the grocery store up the street in Malta. Another contest winner .. Smoky bacon! One winner was Marmite. 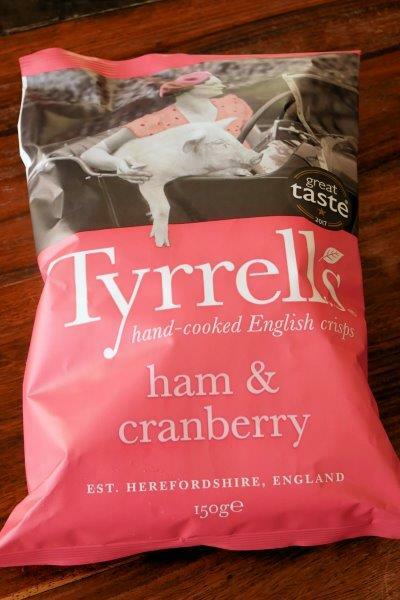 We didn’t get to try this since they weren’t in the store – too popular or not popular at all?? 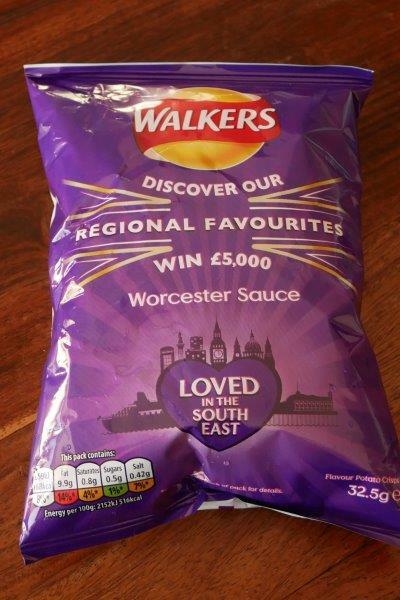 Worcester Sauce potato chips. These weren’t too bad! 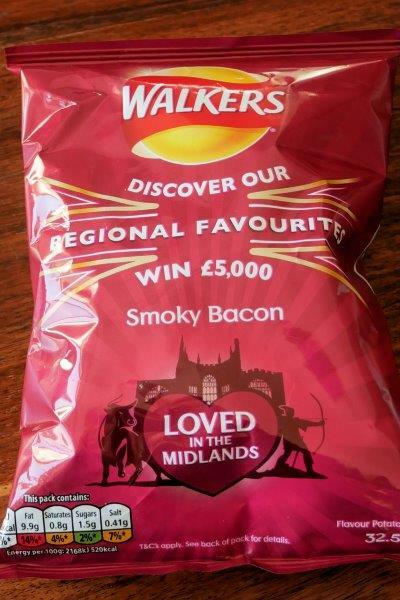 Walker’s is owned by PepsiCo, is British brand, and has the same crowd-sourcing contest every year that Lay’s has. We are wandering our way across the Baltic states and central Europe on our way to Munich for Oktoberfest, moving from expensive Scandinavia to less expensive Estonia and Latvia to MUCH less expensive Poland before reaching reasonable Germany. 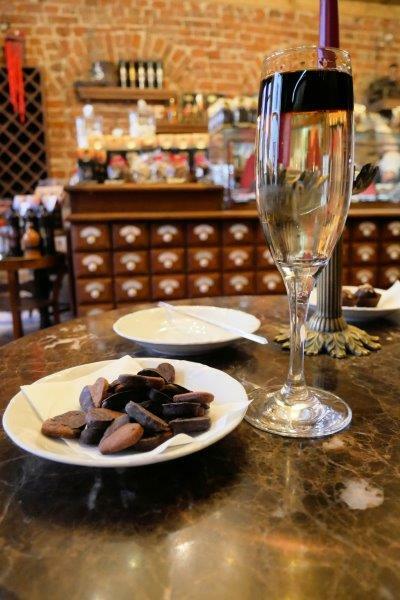 We heard good things about Riga so it was on the list to visit. 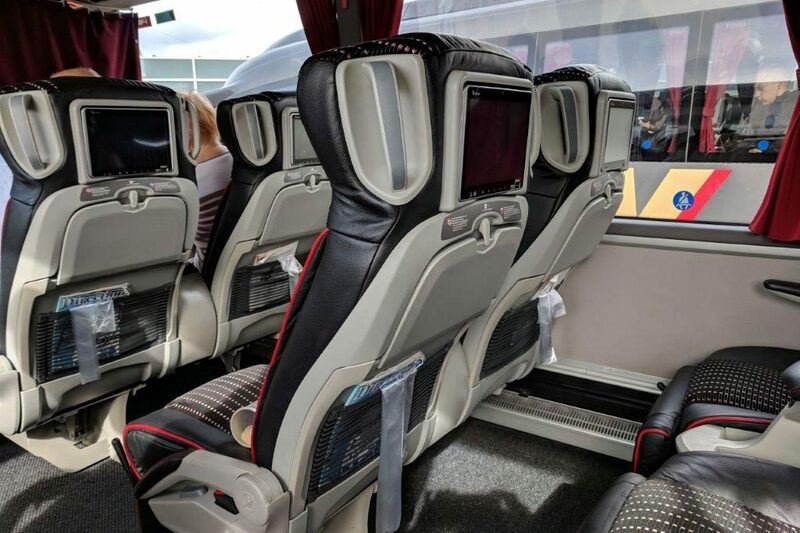 This time we decided to take the bus from Tallinn to Riga and chose Lux Express after doing a bit of research. The ride was 4.5 hours long, cost 28 E each, express from Tallinn, with comfy seats, wi-fi, power in the seats, and videos to watch. We opted for the slightly higher priced tickets only so Mark could have more leg room. 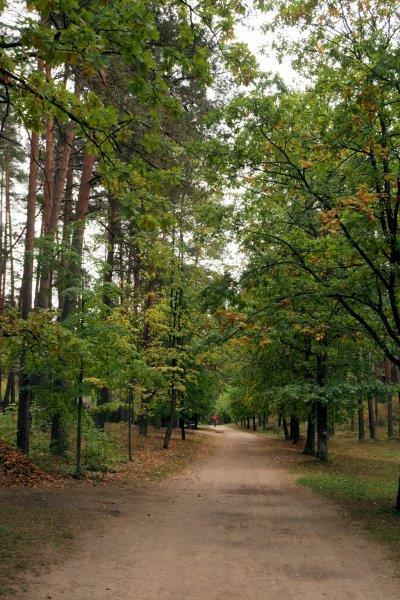 The bus left on time and arrived on time; the scenery was good – lots of birch forests and wooden house; nothing we would call a city between Tallinn and Riga. Note also… the Tallinn bus station is very nice with clean toilets and a few shops to buy sandwiches. Inside of the Luxe Express Bus, complete with video monitors to watch movies in a variety of languages and wifi. Tallinn is charming – a medieval Old Town still in good shape. Riga, on the other hand, is much more cosmopolitan even though it, too, has a small, charming Old Town. 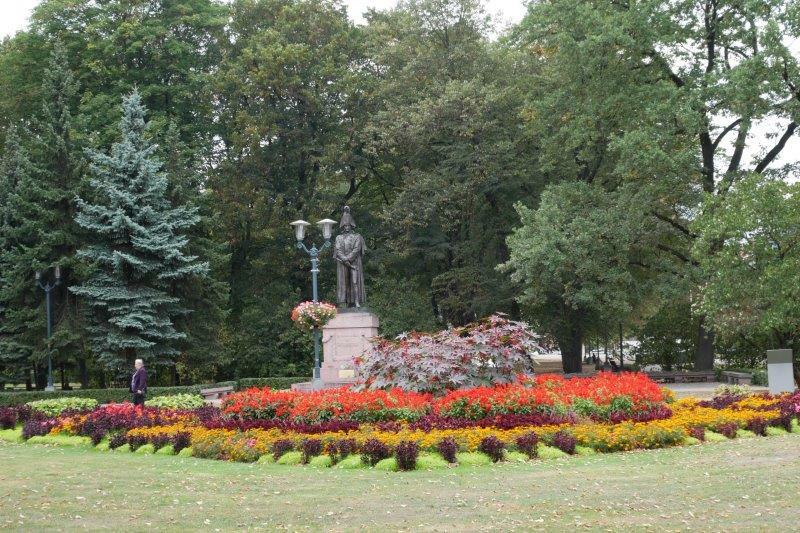 Parks abound in the city filled with beautiful gardens and interesting sculptures. A canal winds through the city as does the Daugava River. The leaves are falling and seem to be raked up daily. 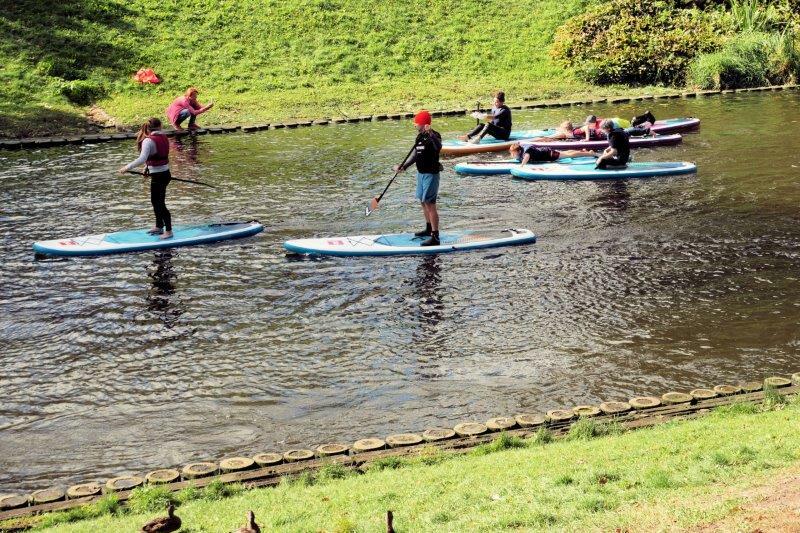 This group was paddle boarding on the canal on Sunday afternoon and then started doing yoga on their boards. One of the many gardens in the parks. 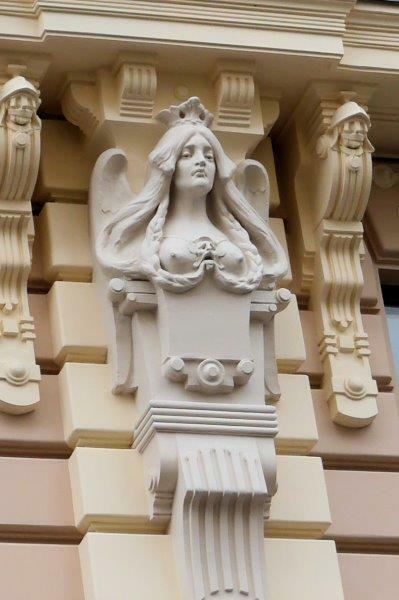 Riga has over 600 Art Nouveau buildings which are beautiful, hiding in plain sight all over the city. 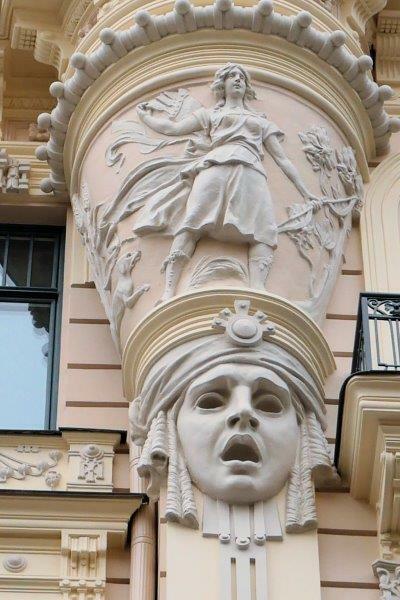 Looking up became a pastime to find all the magical and mysterious touches to buildings. The pictures below were all from one block full of buildings near where we stayed. I’m sure the people who live on this street get tired of everyone staring at their homes and offices. He/she has a matching partner on the other side of the door. Riga has embraced the shopping culture since shedding the Russian influence. We passed numerous shopping malls in our bus rides around the city. They still make use of the old Central Market with fish, meat, and veggies. It was packed on a Sunday afternoon. We have no idea what these fish are even when we went for a translation. 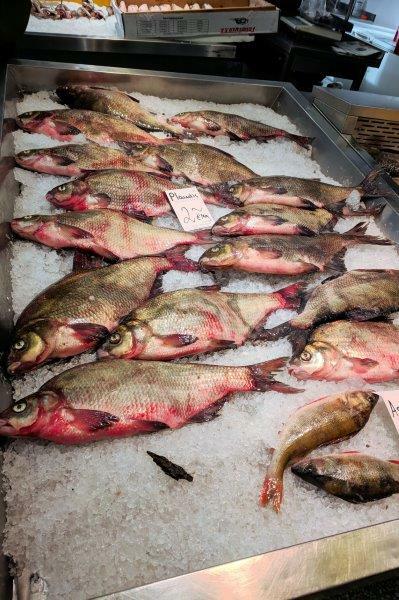 At the price, though, they must be plentiful – about $1 per pound. 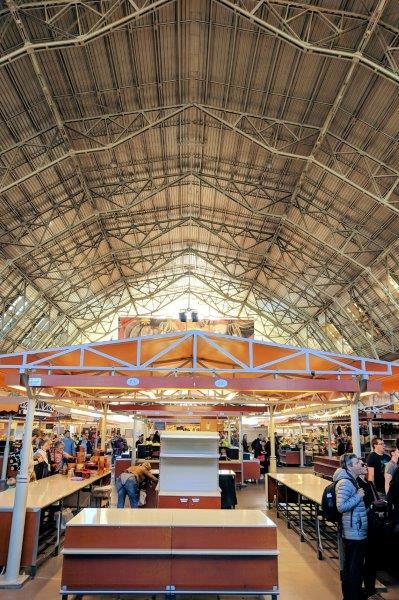 The Central Market is housed in 5 German Zeppelin Hangars for indoor space. There’s space outside where the veggies seemed to be. Watermelon was a big seller this time of year. Smiling is not big in this ex-Russian dominated city. After what they went through with the Russians, Germans, and Russians again, a serious demeanor could be expected. The younger people are a bit more genial although we’re still waiting for the mid-20’s lady in the Costa Coffee shop to crack a smile. She didn’t even ask us what we wanted to order but we noticed she didn’t ask the locals either! 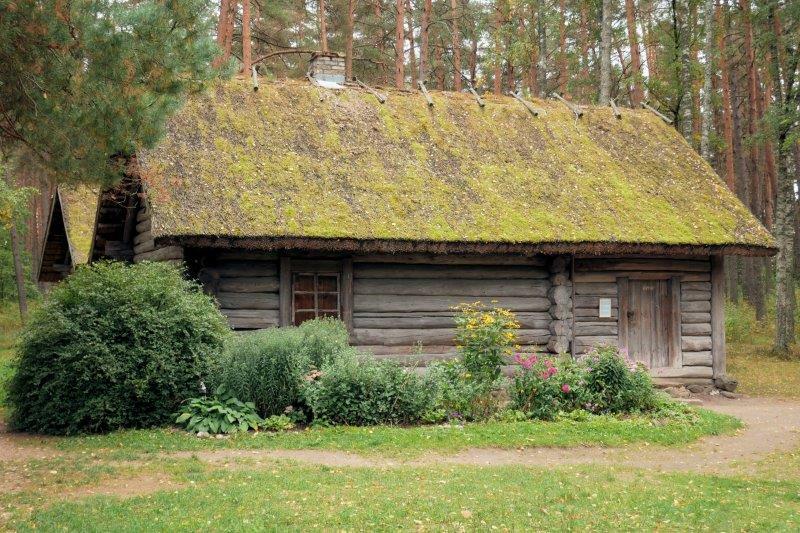 One day we took the bus out of town to the Latvian Ethnographic Open Air Museum to see buildings from all over the 4 distinct areas of Latvia. This building collection began in the mid-30’s, quite a forward-thinking idea at the time. This preserved old buildings from destruction and allows everyone (school groups included!) to understand a bit of life in earlier times. We visited in the middle of the week during the off season and had the place pretty much to ourselves. That being said, we missed any demonstrations of life in the villages that may be done during the peak season, according to friends and the website. One fact we took away was bath houses and saunas have been popular for a LONG time! The Open Air Museum is set in the woods next to a lake. Walking around was calm and peaceful in the middle of the week. Laundry … our AirBnb had a lovely washing machine and a lovely 4 hours wash cycle if you’re so inclined! We opted for a shorter one – about 1 hour this time. Did I mention the elevator? The building in the Embassy part of town had an elevator, too! I love those when it comes to carrying the suitcases in! We were around the corner from the Greece embassy and about 2 blocks from the Russian embassy – noticeable by the fence, guard box, and cameras all around! 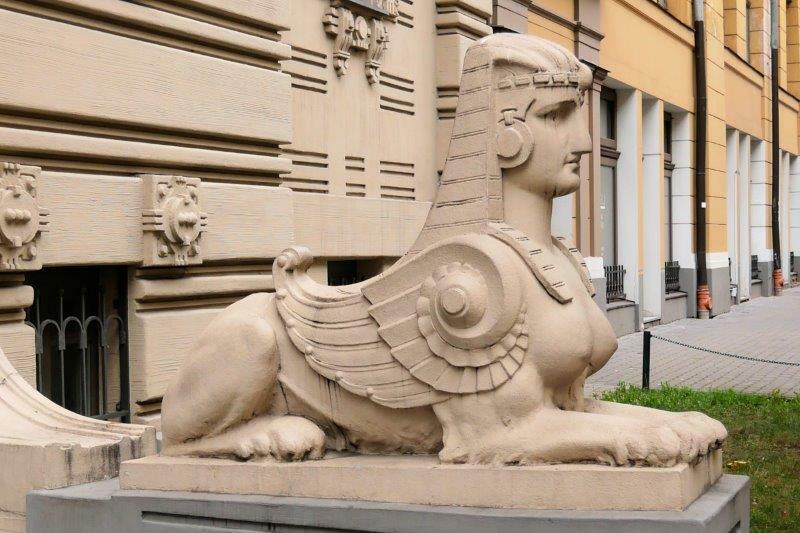 Here are a few other highlights from our visit to Riga. Mark had his in coffee. 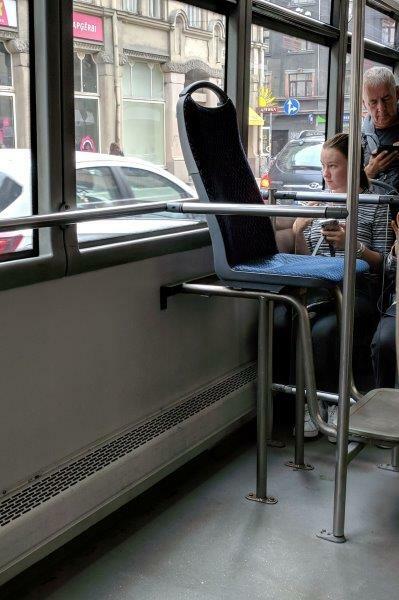 This seat was in a city bus. We have no idea who it’s designed for but it was used by a variety of people from old to young and short to tall. Ore new favorite snack – dark rye bread grilled in butter and covered in smashed up garlic. It’s a common snack to go with beer. 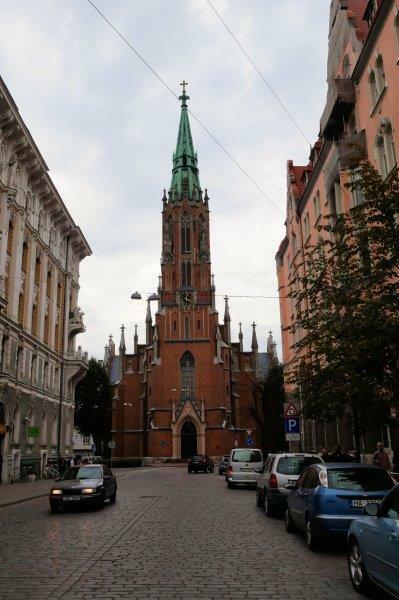 Susan’s grandmother’s middle name was Gertrude so I dragged Mark around Riga to find St. Gertrude’s Church. She is also a patron saint of travelers. How appropriate! 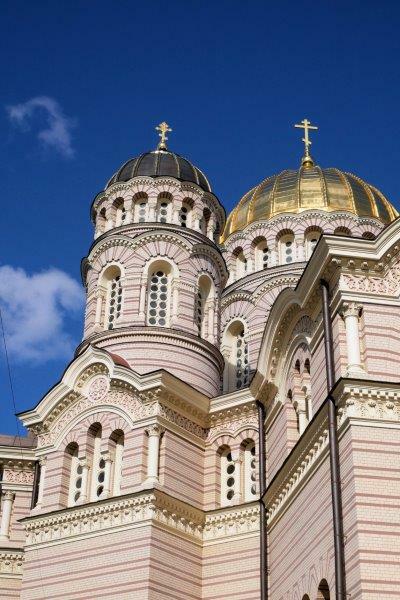 The Nativity of Christ Orthodox Church in Riga is the biggest Orthodox church in Riga and has been completely restored since the Russians left. They used it a a restaurant and a planetarium at various times. After spending about 2 months in Australia, we had to figure out some way to get back to the U.S. or wherever we went next. We see “repositioning cruises” advertised all the time, mainly between the U.S. and Europe but we figured the cruise lines have to get their ships back to the west coast in time for the Alaska sailing season after spending the Southern Hemisphere summer sailing in Australia/New Zealand and the South Pacific. Off the Chief Travel Planner went to Google and quickly found a website, www.repositioningcruise.com. It turns out there weren’t many to choose from, but Holland America was moving the MS Noordam from Sydney to Vancouver starting on April 13 and we could disembark in Honolulu on April 28. Yes, that makes this a 16-day cruise. We crossed the International Date line so repeated April 21, just like “Groundhog Day”. 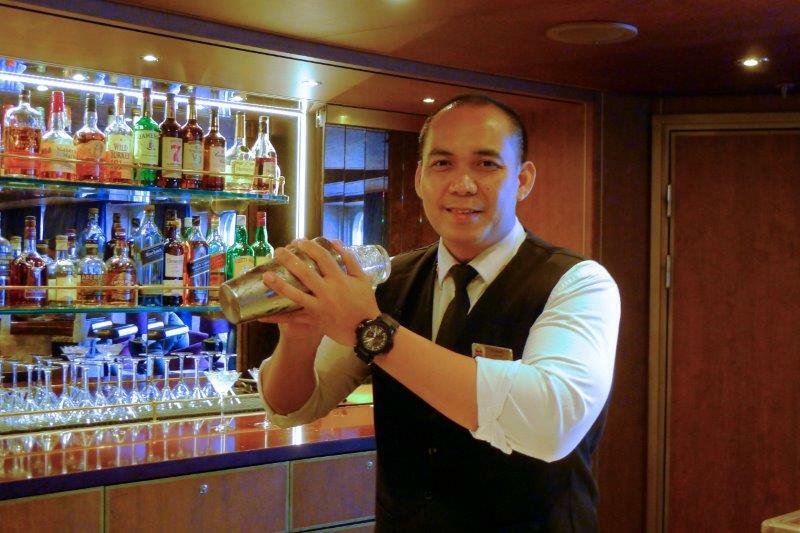 Our favorite bartender, Rommel, in the Pinnacle Bar. 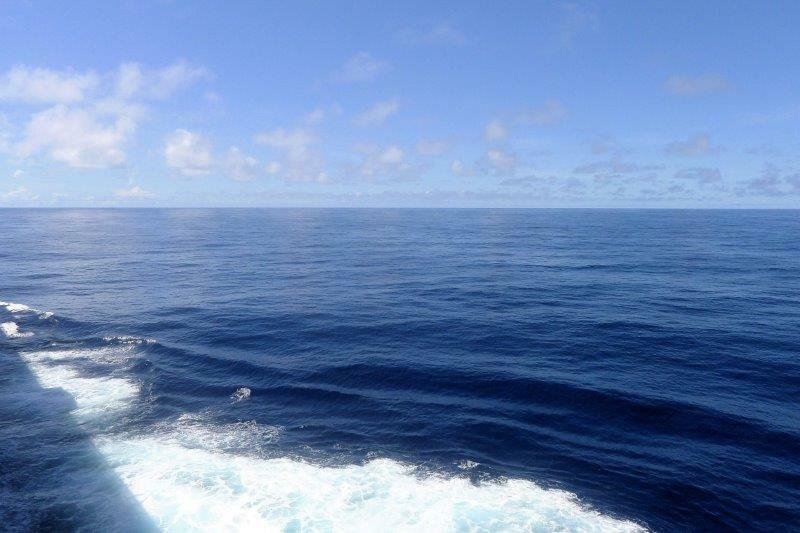 Fortunately, most of the days at sea had flat water and sunshine. 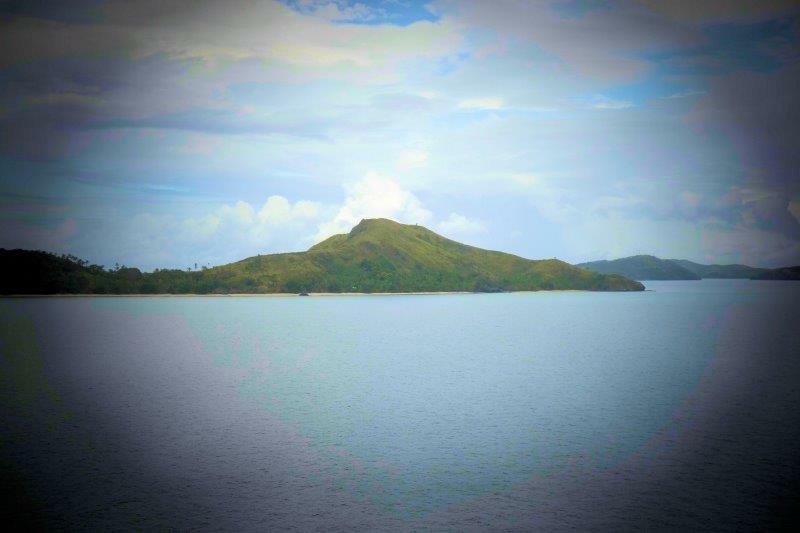 Humidity increased as we approached the equator, reaching 98% in Pago Pago. 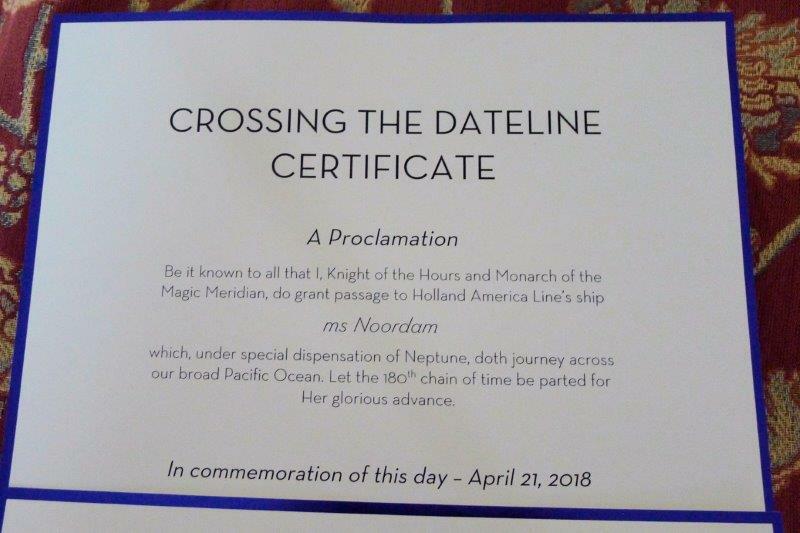 Official recognition of crossing the International Date Line. A daily schedule was in our cabin every night for the next day. Two of them had the same date … different agendas for the 2 days it was April 21. Per, our Norwegian friend, celebrated his birthday twice! Boarding the ship in Sydney – no problem! Mark had to go on a hunt for his luggage but discovered it was in Ship Security waiting for him to remove the knife they saw when x-raying the bag before it was loaded on the ship. We traveled with a sharp cooking knife after being in a number of apartments with less than sharp knives! They missed/ignored the corkscrew, a knife on a cutting board from Tasmania, and a Swiss Army knife he had. 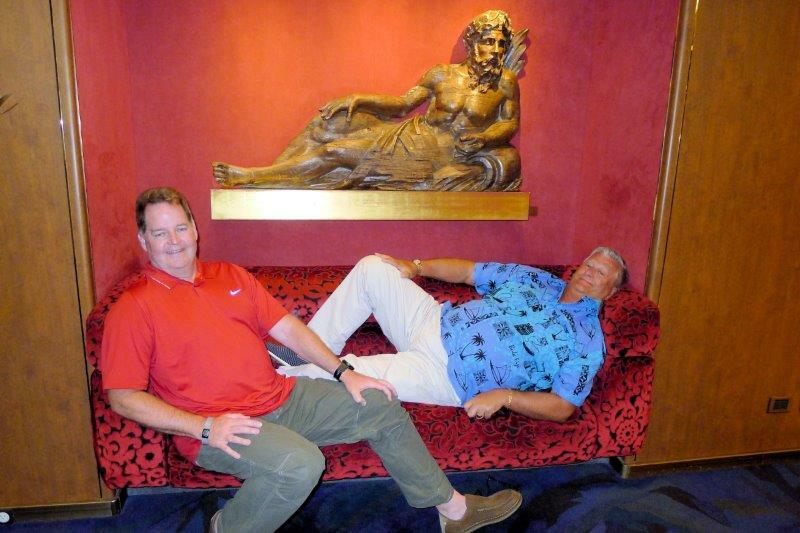 The knife was returned on the last night of our cruise. Our cabin was compact but had enough room for our few clothes. Let’s just say that Gala Nights didn’t see any tuxes or ties or jackets on Mark. 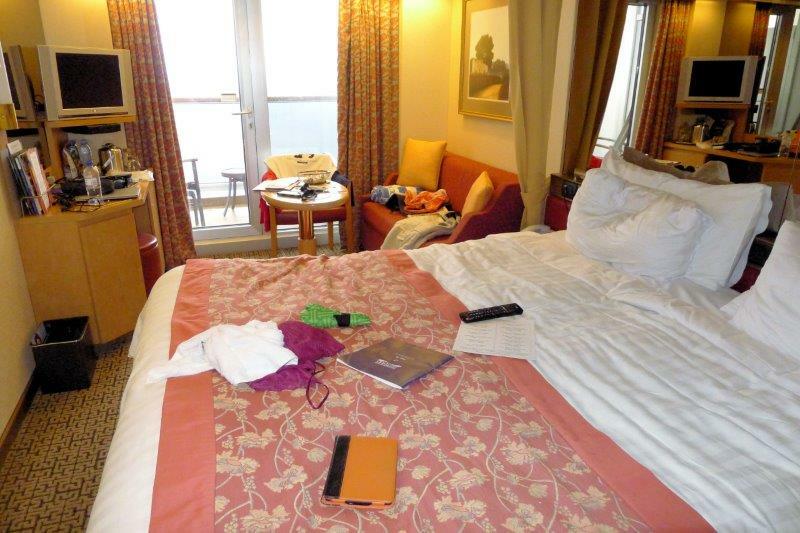 Susan used the cruise as an excuse to buy a few clothes in Sydney and Melbourne. This was home for 16 days. Average age of 1900 passengers – guessing 75-80 or so! We’re sure we were in the youngest 10% of the passengers – about 190 people. We saw one baby, about 5 children under 15 and the associated parents of said children, and a family of 4 from Alabama. We met one lady who just retired and 2 women with their 85-year-old mom. The other 170 people in the “10% Club” we can only guess at. The ones we put in the club are either truly younger or have really good genes. The passengers were a majority Americans but LOTS of Canadians and Australians with a handful of other nationalities represented – German, New Zealand, UK, Norway. We met some fun people – Per and Lise from Norway, Tim and Debbie from London who traveled for 5 months before the cruise, Jan and Chris (UVA grad) from Texas. We quickly found our favorite bars and bartenders and got into a routine – wakeup, coffee, breakfast, workout or walk, read, watch movies, sit in sun, before dinner drinks with the group, dinner at 8 PM, after dinner drinks, bed … repeat! This is what two passengers do when they’re the last out of the dining room and have had a few glasses of wine in the evening plus a Hendricks and Tonic and pepper and cucumber. Per and Lise live in Norway. He’s a ship’s master/captain and they have some interesting stories about taking oil ships around the world. 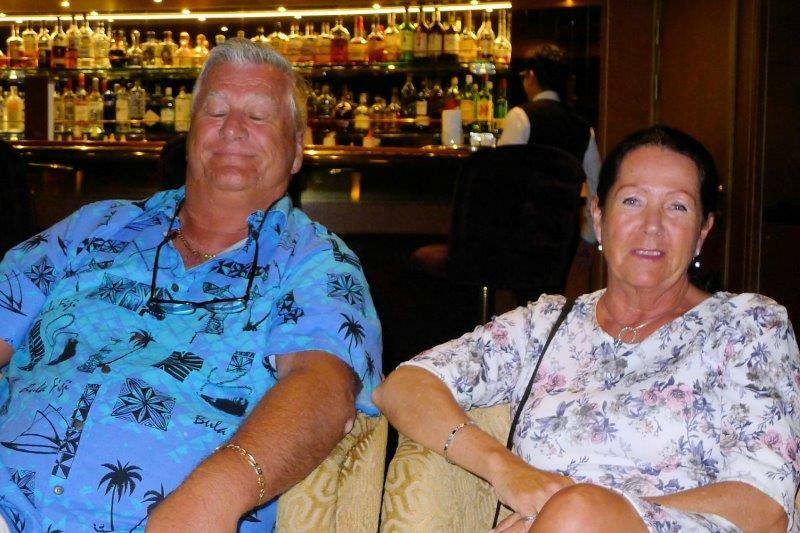 Tim and Debbie live in London and are semi-retired, traveling while they’re young! 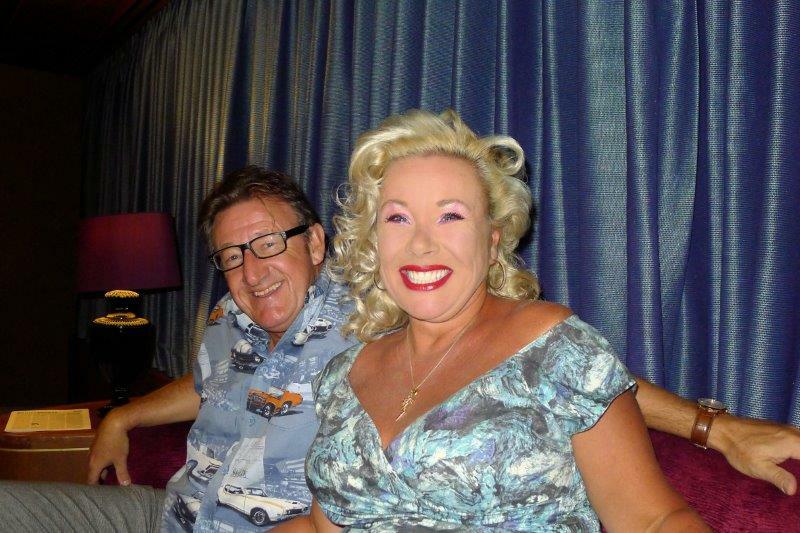 Tim loves Bingo and Debbie knows all about Elvis. Two nights Tim and Mark stayed out late (1:30 AM) and they’re sure they were the last 2 passengers awake on the ship. We often were the last table to finish dinner and the last bunch to close the bar – about 11:15 PM. With a passenger list as old as on this cruise, the dining room was packed at 5:15 when it opened for dinner and fairly empty at 8 PM when we went to dinner. 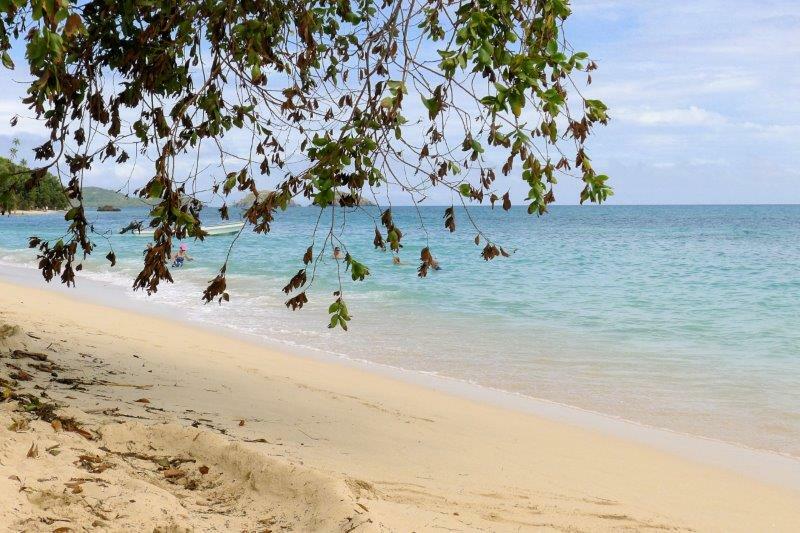 We made stops in New Caledonia, Vanuatu, Fiji and Pago Pago, American Samoa. You can check out the map on the Trip Statistics page to find the locations of the various islands. 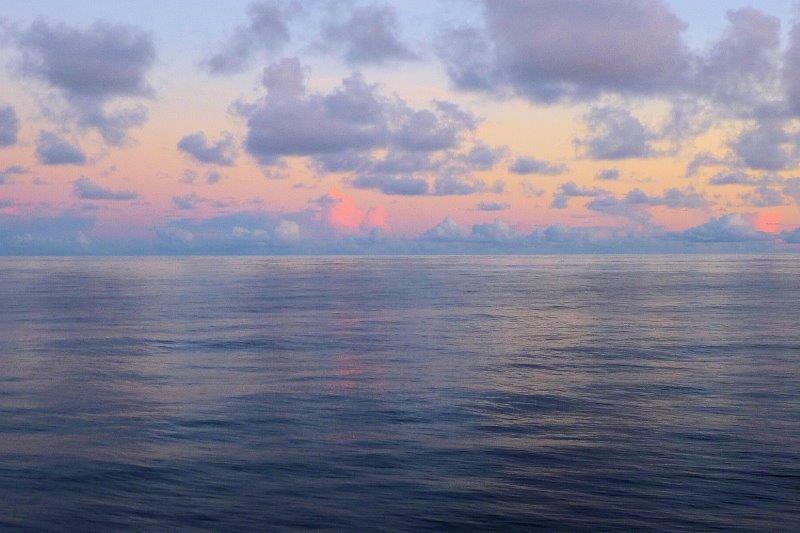 We also had 5 straight days at sea before we arrived in Honolulu. Dravuni Beach wasn’t as soft as Kuto but had warm, clear water. 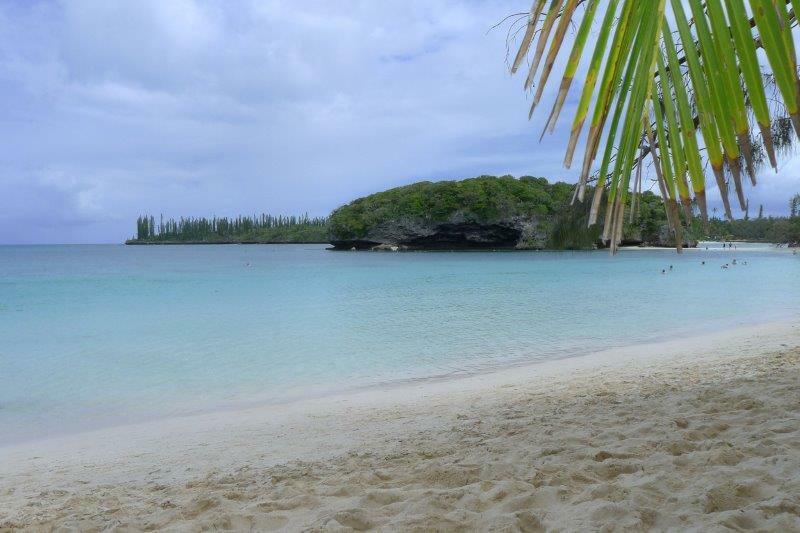 Kuto, New Caledonia. This was the best beach of the entire trip with soft sand and warm water. 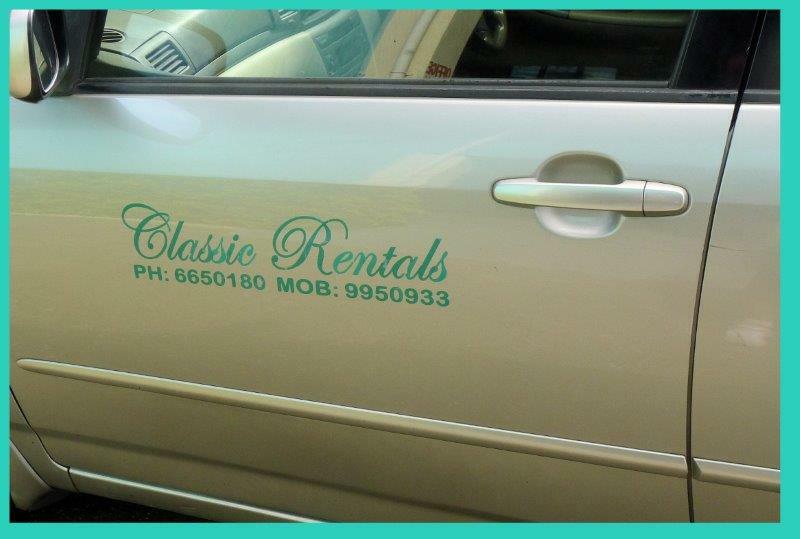 We rented a car in Lautoka, Fiji, to drive to Nadi for some shopping. Driving was a piece of cake and the roads were great after 2 weeks on Indian roads. 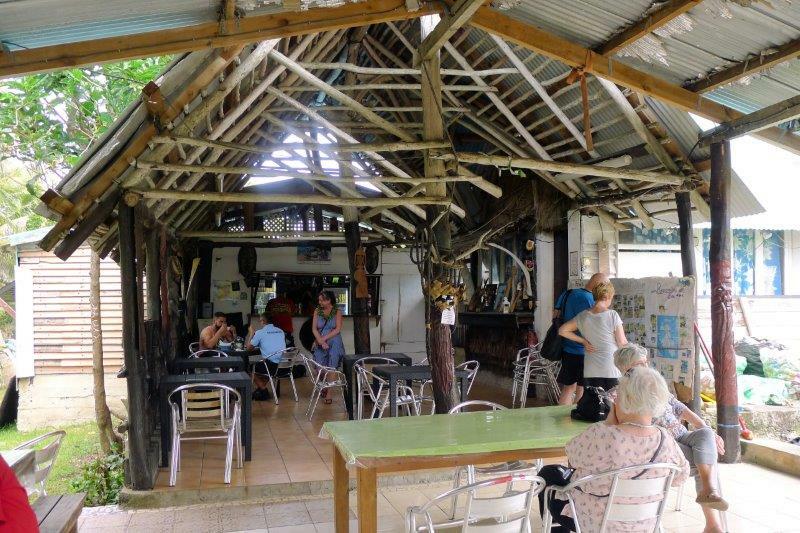 The local bar at the the port on Easo on Lifou, New Caledonia. I have no idea what this plant is. 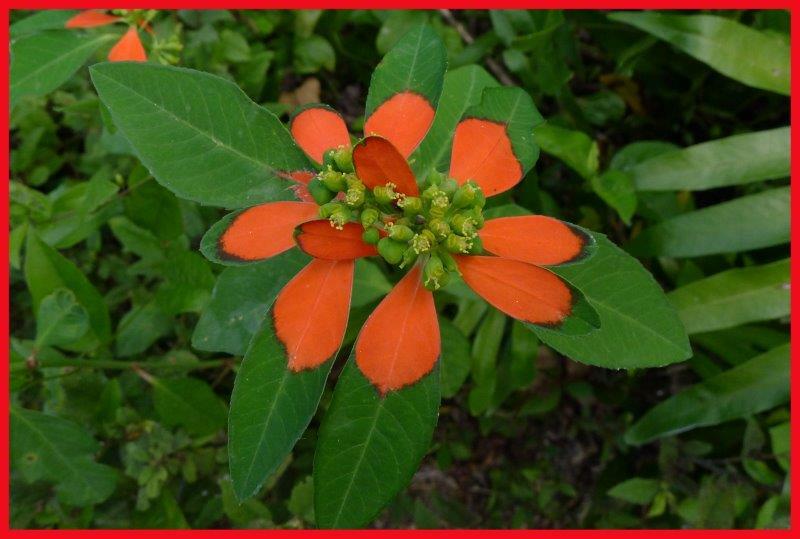 It resembles a poinsettia with leaves/petals that are partly red and partly green. 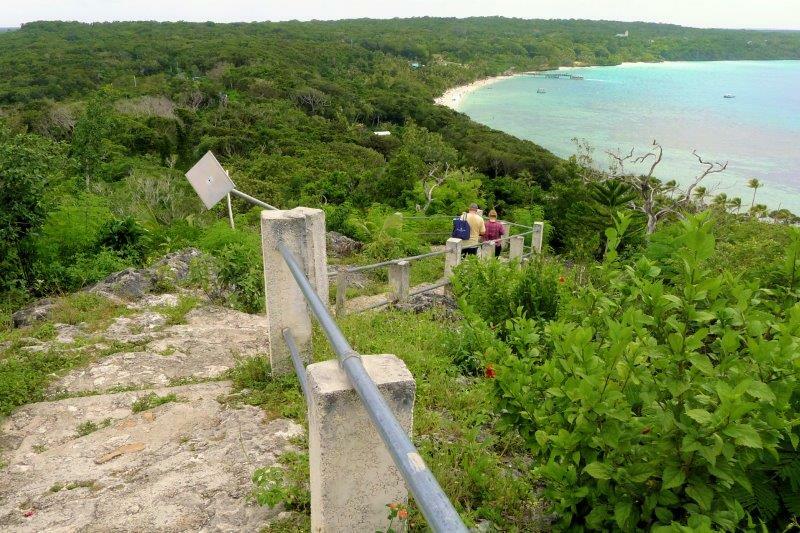 We trekked up this hill on Lifou in New Caledonia to see a church with a great view. 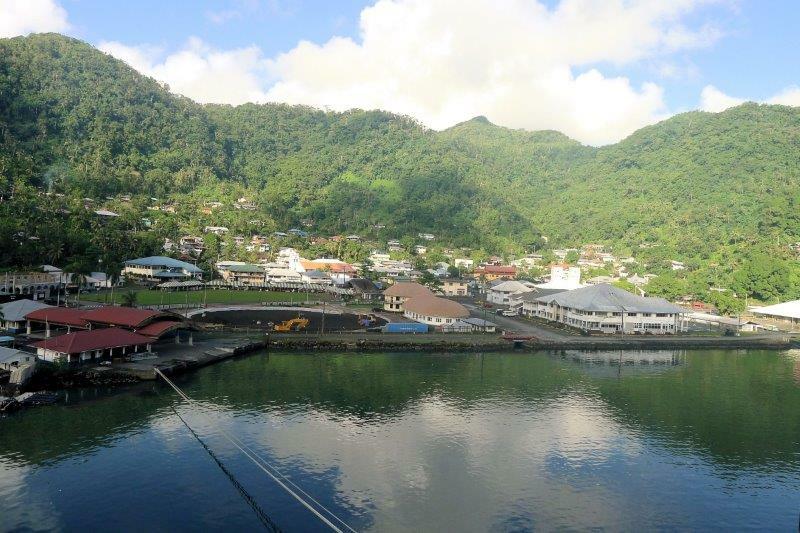 This is the Pago Pago port in American Samoa. Susan didn’t see much of the port after she slipped in mud on a sidewalk and sprained her wrist. She was the third or fourth person to slip in the same place that day! 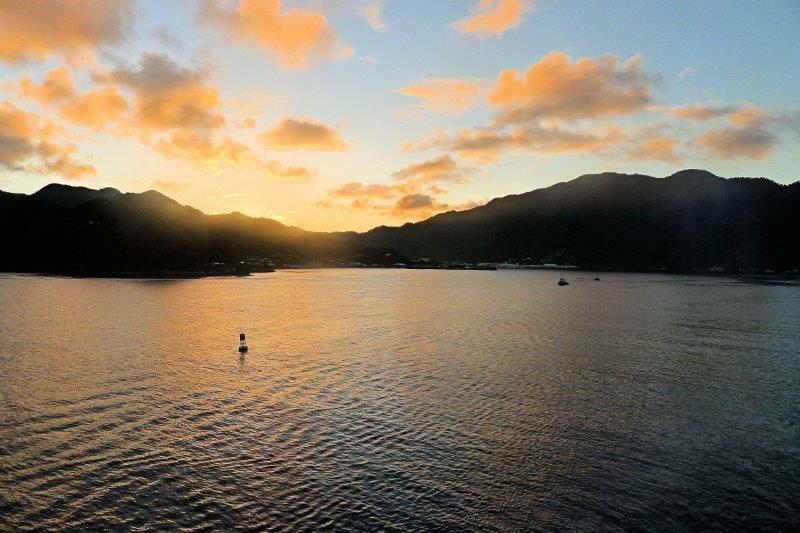 We had a lovely sunset as we left Pago Pago. A very small roll of toilet paper! For whatever reason, toilet paper in India is quite thin but the rolls are also very small – as in not many sheets of paper. One was so small, it only lasted a day! And, no one had Delhi Belly! We flew Condor from the Seychelles to Frankfurt because that’s the only direct flight to Germany and we really didn’t want to connect through either Istanbul or Dubai. The flights all leave Mahe late at night (10 PM or later), making the connections at 0 Dark 30. After flying for 10 hours, the Condor flight landed on time and our body had a small weather shock. It was about 85 F when we left the Seychelles and it was 32 F when we landed in Germany. What was Mark wearing?? You guessed it – shorts! One flight attendant looked at him and said, “I hope you have pants packed someplace.” He did! Our luggage with all our summer and safari clothes actually showed up and we managed to have some coffee before we met the Lufthansa shuttle to Heidelberg. The room was ready when we showed up at 10 AM and our suitcases with winter clothes (We’d left them in Heidelberg with friends.) were waiting for us! By the time we sorted out dirty clothes and found warm clothes, the snow started. 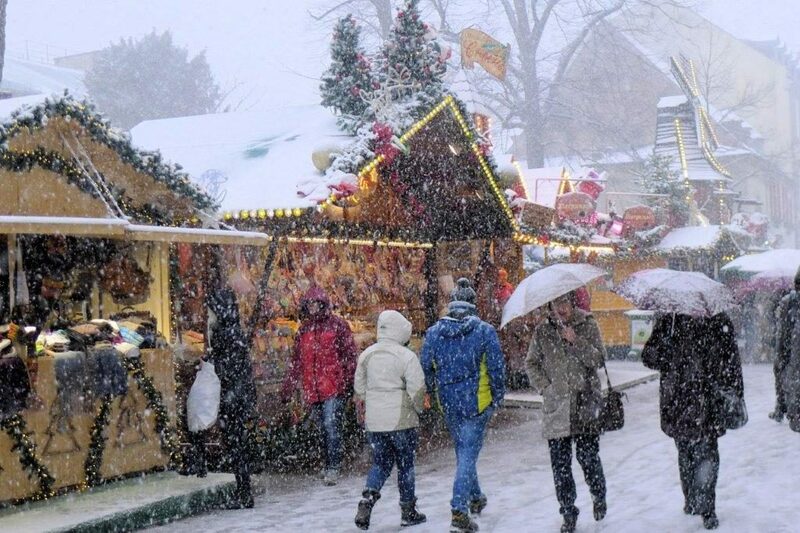 The Christmas markets are pretty magical when everything is white, even if it was wet snow. 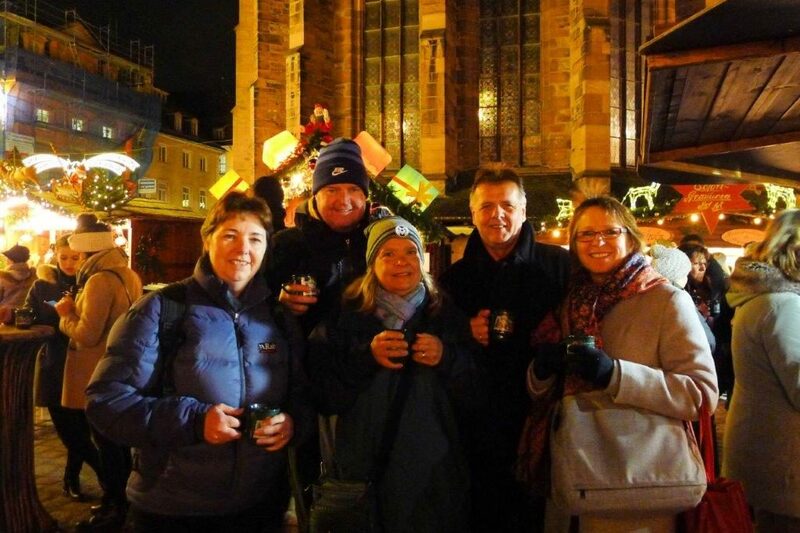 When we wandered back to the markets in the evening for some more gluhwein (Susan’s favorite! ), the snow stopped and was all melted! Mark has melted snow flakes on his face from all the wet snow. Yes, we were having a dunkel beer to warm up! 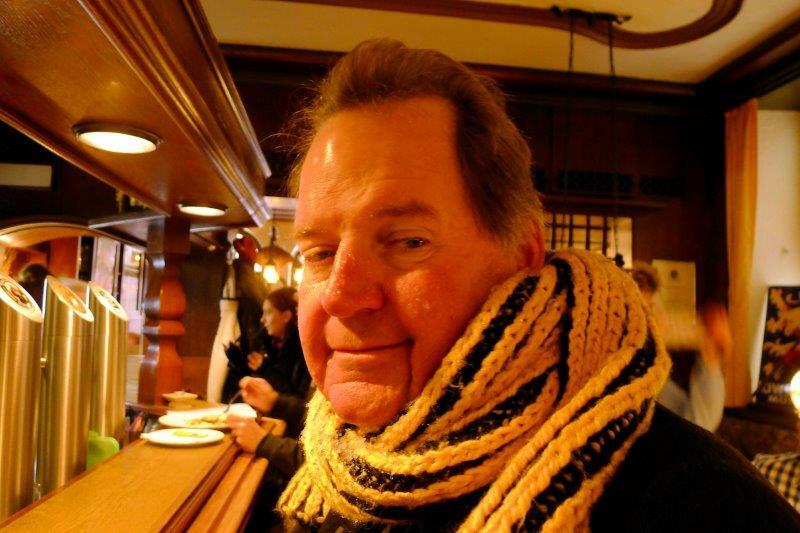 And he’s wearing the U. of Iowa scarf to stay warm. It’s always nice to see familiar faces and this time we enjoyed meals with 2 different sets of German friends. The first night (after we managed to get our clothes washed!) we met Joachim at Heidelberger Kulturbrauerei for beer and dinner. 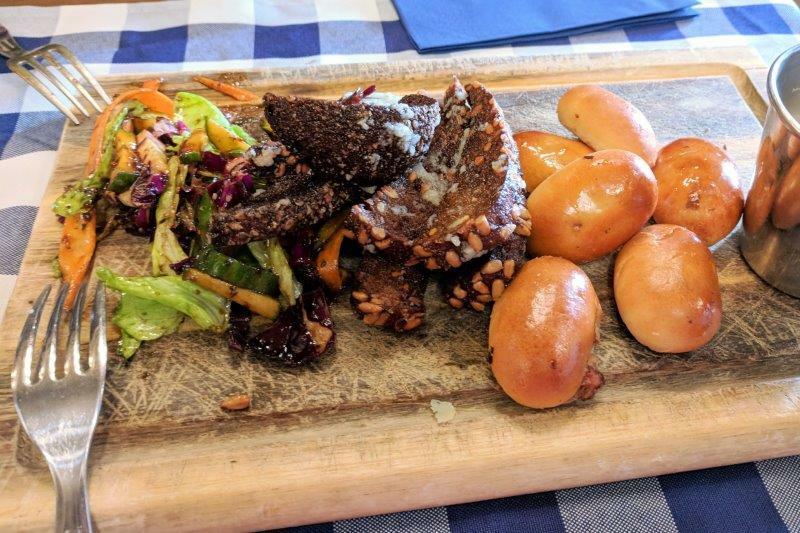 The sauerbraten was really good, and the side dishes were enough for all to share. Their November beer was good even if we drank it in December! 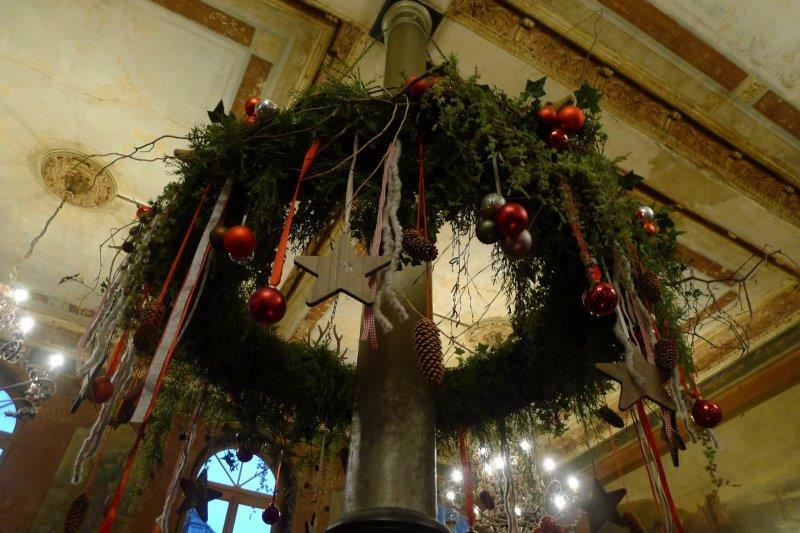 The second night after a day of shopping for supplies, we met Bettina, Michelle, and Hermann for gluhwein at the Christmas market and dinner at the Zum Güldenen Schaf. It was a fun night with the gang who’s being so kind to store our suitcases and clothes so we don’t have to take them all with us everywhere! 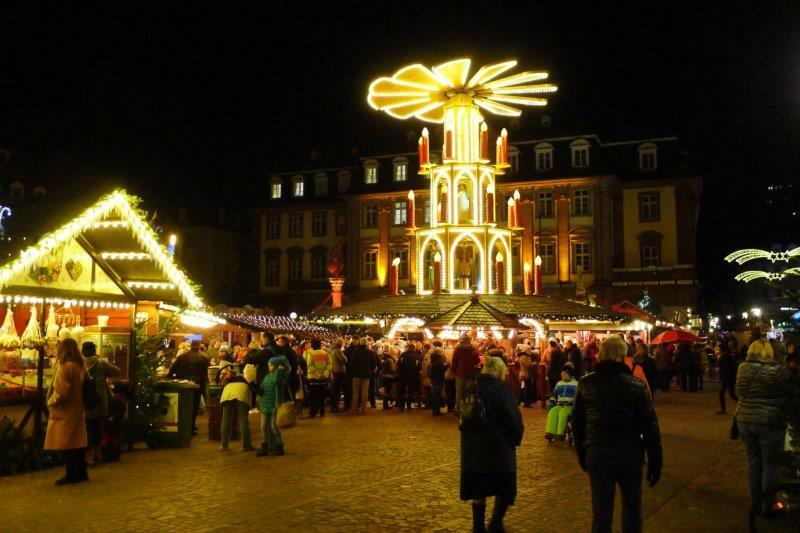 This Christmas pyramid was on the main square in Heidelberg. 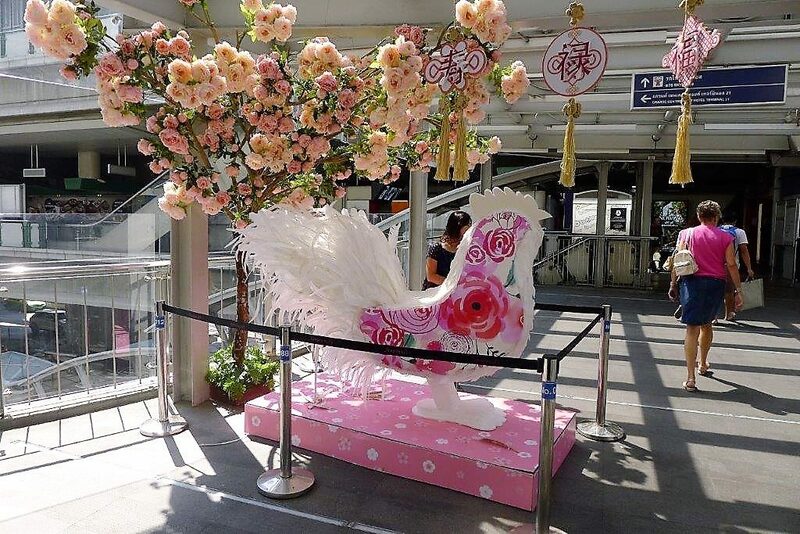 There were at least 5 different market locations in the city, including one with an ice rink. 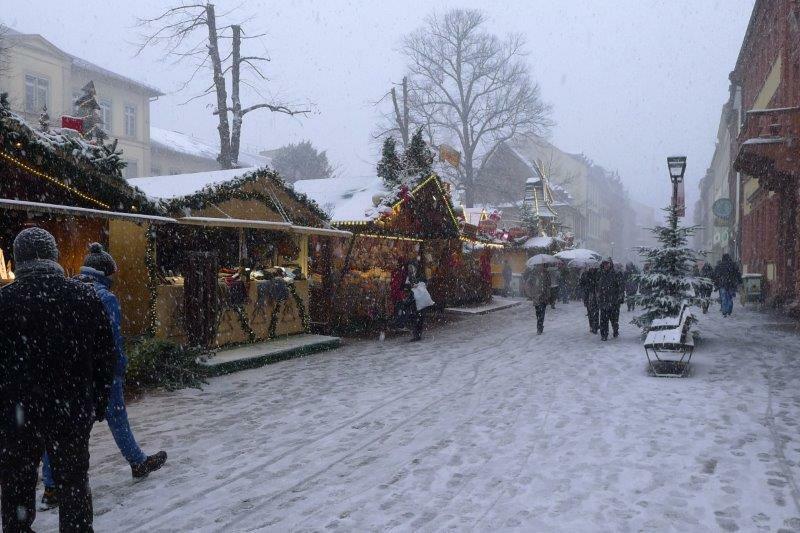 We were all trying some Gluhwein. It’s pretty hard to hold the cup with mittens on. 11/26 It only took 3 months to have a Credit Card compromised! We wondered before we left Fort Collins how long would it take for one of our cards to be compromised, either through a data breach from our issuer or from someone “skimming” our card. As it turns out, it took less than 3 months. It appears that our card was “skimmed” in Cape Town South Africa. What is skimming you ask? Here’s the definition from Investopedia: An electronic method of capturing a victim’s personal information used by identity thieves. 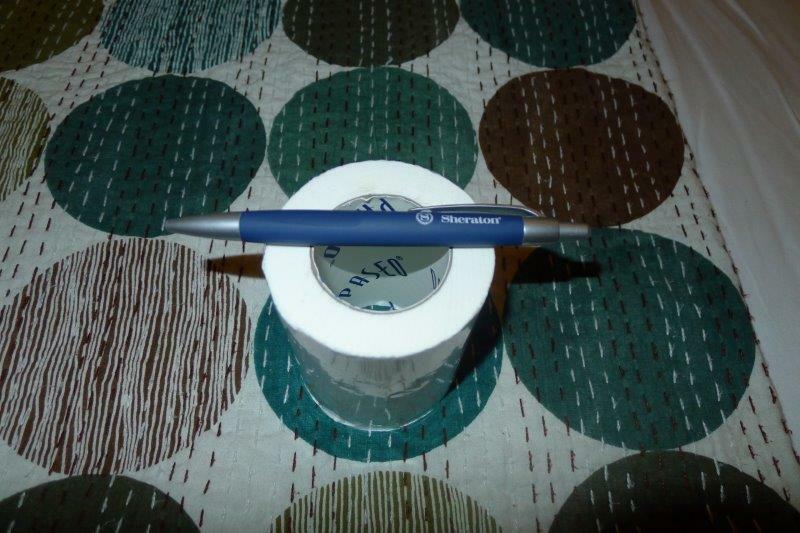 The skimmer is a small device that scans a credit card and stores the information contained in the magnetic strip. Skimming can take place during a legitimate transaction at a business. A skimmer can be placed on an ATM, gas pumps, or a waiter or waitress can have a device on their person. We figured out that we were compromised at the Johannesburg Airport when we had our debit card declined when we tried to buy lunch snack food at a convenience store for the equivalent of $10 and it was declined. We had used the card in Cape Town for the past 3 or 4 days without issue. We were on our way to the Seychelles so we had to wait to call our bank until we got to Victoria, Seychelles. When we arrived at the hotel in Victoria, Seychelles, around 10 P.M. local time, Mark had a voice mail and it was time to call our bank – First National Bank. We called using Skype (There’s another story about using Google Voice, and not really being Google Voice.) and Mark spoke with a nice lady who wanted to know if we were traveling in South Africa. Mark, sounding a bit annoyed, said “Yes, I told First National in August all the countries we were visiting during our 9 months”. The lady said, “OK. So the charge for $2,500 for cellular network is legit?” That would be a “NO”. She asked if the 2 charges at the home improvement store for $1,200 & $300 were legit. That was another “NO” and then Mark thanked First National for declining the charges. The nice lady brought on a personal banker, Wade, who asked some of the same questions. We asked if First National knew if the card was skimmed and, if so, where? Wade said they weren’t sure if it was skimmed, but the card had been marked as fraud. Next up was how to get a replacement card to us. 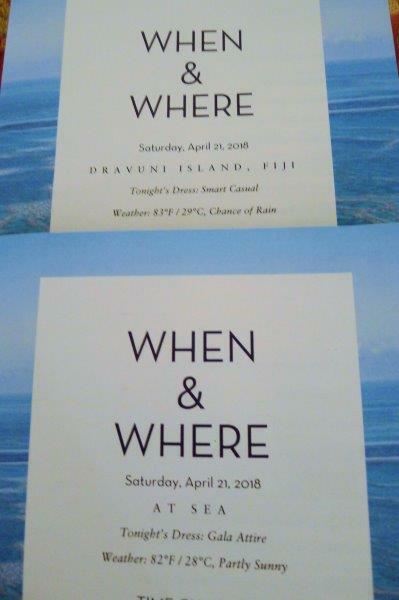 After some talking with 1NB, checking with First National management, and talking to our favorite person at the next chain hotel we would be staying at in the Seychelles, Le Meridien, First National gave the go-ahead to send us a new card via FedEx. We are keeping our fingers crossed it will work. We want to give a big shout out to First National Bank for detecting the fraud and for working with us to get us a new card in the Seychelles! Skimming tips: We always check an ATM or gas pump prior to inserting a debit card/credit card to check for a skimmer. Check the slot with your fingers and see if it’s one piece or not. We check regardless if we are in the US or traveling the world. These are the favorite targets for thieves. Not much you can do if a waiter or waitress is carrying a skimmer on them. Using an ATM … cover the keyboard when entering a PIN because the bad guys need the PIN in this case. In the Seychelles, as well as in most of Europe, the cards are scanned right at the table in restaurants. If U.S. credit card companies would actually go to true Chip and Pin (get rid of the magnetic strip and require a PIN be used for ALL credit card transactions) many of the skimming problems could be eliminated. How to describe this adventure? This post will be rambling as was the hunt for the Muonza Family, a family that has been an easy hike to see since June (important point). DC man and woman (DCM and DCW) – in their 70’s, we’re guessing. Alabama man and women (ALM and ALW), friends with DCM and DCW– younger, maybe in their 60’s. DCM, DCW, ALM, ALW had trekked the day before on what turned out to be a steep hike in the forest for 2 hours. That was their description of that hike and they made sure to tell the guide, Patrick, and the group about this. The day before they’d been accompanied by another friend who used eight porters to carry him on a stretcher to see the gorillas. This is an option for $200. Since we never saw the stretcher (“African helicopter” as the guides call it), we have no idea what it looks like. Friend opted not to come on the 2nd trek. Note: if you do a hard hike one day, you will generally be assigned an easy hike for the next day. Patrick tells us about our family and its silverback leader and off we go. Mark and I each hire 2 porters and Tom hires one porter (important part of the story). The other four people hire one porter per couple. We trek through farm fields and DCM slips off a ledge about 2 feet and tells the guide he needs to stop. The guide talks with DCM and the DCM continues on the trek. Note – you are told that when the group starts, the group has to stick together since there is only one ranger with a gun with the group and the group can’t be split up. We reach the wall, and start hiking UP the volcano. The whole time Patrick is talking to the tracker about the gorilla family location. The whole saga goes from bad to ludicrous from here on. When we reach the wall, DCW wants to know how far away the gorillas are because they have to be done with the trek by 11 AM so they can go back to the hotel, pack, shower and drive to Kigali because they have 17-hour flight to get home to the US. “They were promised the trek would be done by 11 AM”. It’s getting a bit slippery, but Susan’s two porters are amazing in the slippery places and steeper areas. One of Mark’s porter and Tom’s one porter go off to help DCM and DCW. A bit further on, DCW complains “the trek is taking too long and they have a 17-hour flight home. They can’t keep trekking. 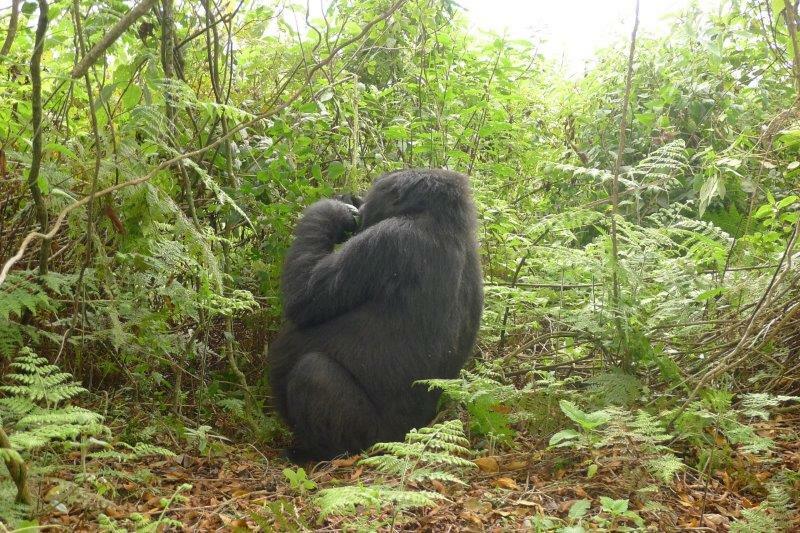 They were promised this trek would be short.” The tracker via radio tells Patrick that Silverback Muonza has figured out that another family is in the territory and has gone off to fight with them to chase them off. 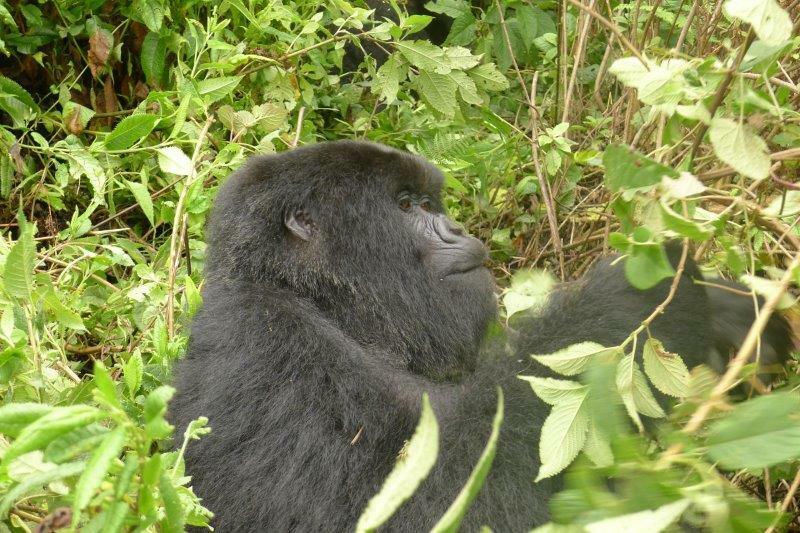 The rest of his family is scattering through the forest but a few gorillas are nearby. Patrick tells the DCM, DCW we are only 10-25 minutes from the gorillas. He encourages them to continue. 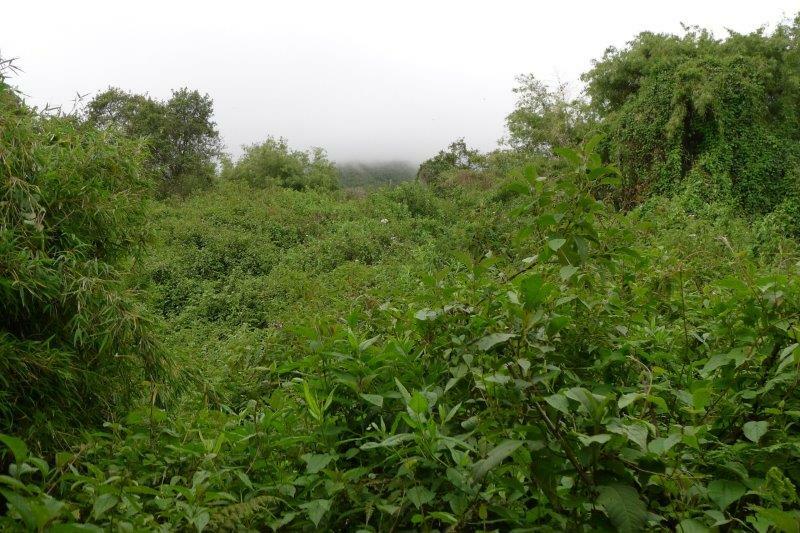 We had paths part of the way but, eventually, the trackers cut the jungle away and we trekked through it. Patrick was our guide for Trek #1 and the search for the elusive group. Another note: Before you can visit with the gorillas, you give your walking sticks and backpacks to your porters who stay with them. The only people who go to the gorillas is the guide, 8 visitors, trackers, and ranger. Anyway, we all stick together and manage to see about 4 gorillas for a short amount of time. To see more of the family, we have to trek through rain forest that is being hacked down by the trackers. At this point we are going straight uphill and walking over very slick plants that have just been cut by the trackers with machetes. DCM and DCW refuse to go any further so Patrick has to decide what to do about porters, trackers, etc. DCM and DCW stay in a clearing with two porters while the rest of us go chasing through the jungle with trackers using machetes to hack down the undergrowth. Thank heavens they helped me walk on the undergrowth (I must have looked pitiful.) to keep my feet from getting tangled and falling! Watching a gorilla have a little snack. The gorillas were bigger than I imagined. This one was sitting on the trail. We see another two gorillas before the gorillas take off running. At this point we all head downhill to a clearing with Patrick trying to find out where the silverback is. Now, ALM and ALW say it is getting late and they all need to leave and they can’t go without DCM and DCW – remember the 17 hour flight! The porters bring DCM and DCW to our group and after a bit of discussion, the four of them with their two porters and a tracker leave. We have no idea if or how they got down because at this point Tom and Mark each get their porters back. DCM & DCW asked why the porters weren’t going with them and Patrick said they didn’t hire the porters and the porters were staying with Mark & Tom. With all porters back, we go downhill to try to find the silverback. Thank heavens for John (an ex-poacher) and Emil who helped me through all the brush and mud and over rocks and down slippery slopes. The three of us were pretty far behind Mark and Tom and Patrick. We all met up in a potato field at the bottom while Patrick checked with the trackers again/continuously! 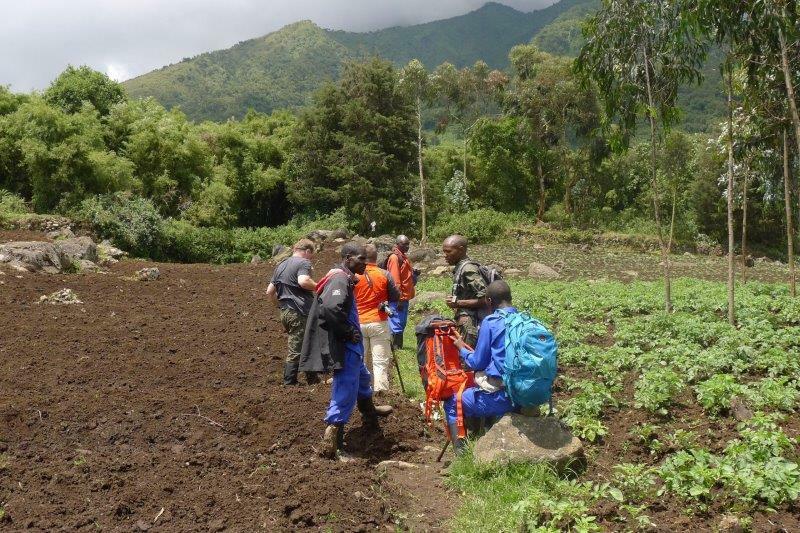 This was our group at then end of the trek as we waited in the potato fields for an update from the trackers. It’s now been 4 hours of hiking and we are all (probably not the porters) tired. When Patrick hears that the silverback has headed up the mountain to find his family, we admit defeat and head back to the cars. We could tell Patrick was very frustrated with the gorillas and with DCM, DCW, ALM, ALW. 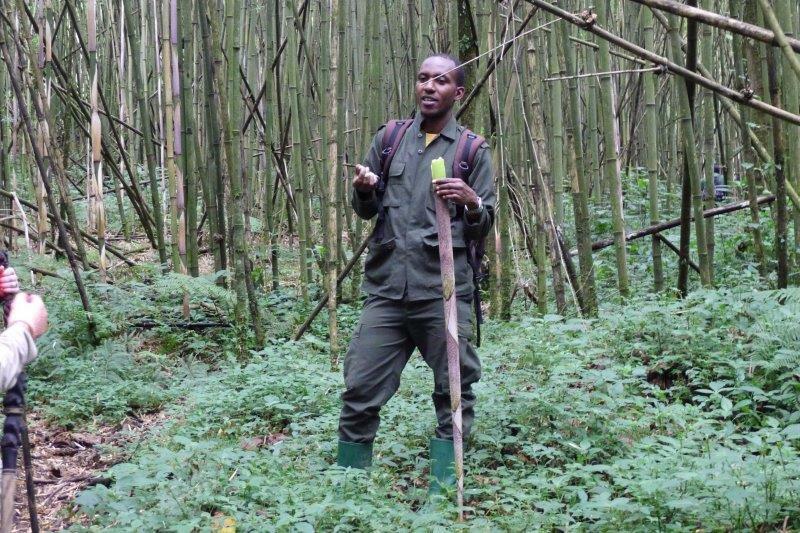 He just shook his head and apologized because we didn’t see the silverback of the Muonza family – it’s nature! The next day, our guide, Fernando, told us that trekking guides have to fill out a report if they don’t see gorillas and the group can come back the next day for a free permit or get another one free the next time they visit Rwanda. It was an adventure! Our group of three was the last one to return of the day and Patrick reported to the head ranger that Muonza Family needs to be reclassified as hard family because the silverback is moving around trying to add females to his family by fighting. He promised we’d get an easy family tomorrow! We started out as an easy group, but finished as the hardest trek that day. All the Rwanda people we spoke to knew that our family had become the most difficult trek. We climbed over a 650 feet in a mile so we had approximately a 12.3% grade. T-shirt #1 – A t- shirt for sale in a shop … “Who needs a boyfriend when you have wi-fi and pizza?” accompanied by a picture of pizza and the wi-fi symbol. They had this shirt in English and Croatian but were out of the Croatian one. I’d have bought it! T-shirt #2 – Black shirt with black letters – “I’m a lot cooler on the Internet”. T-shirt #4 – “I don’t need Google. My wife knows everything.” This one is complete with the Google colors. These are all either for sale someplace in town or we saw people wearing them. People wear t-shirts that make no sense. We see ones from made up U.S. colleges, universities, athletic teams – wrong towns, wrong colors, wrong logos. I’d love to take pictures of all the wrong shirts! Camp David is a real brand of clothes in Germany but we always think of Camp David, Maryland (the Presidential retreat) so it looks a bit odd to us. 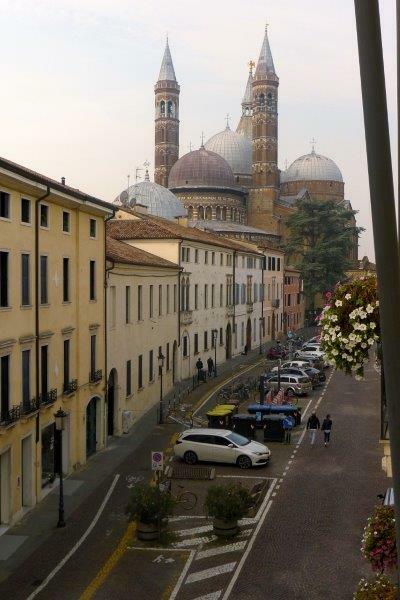 When we left Munich, we took the train to Padova (Padua). 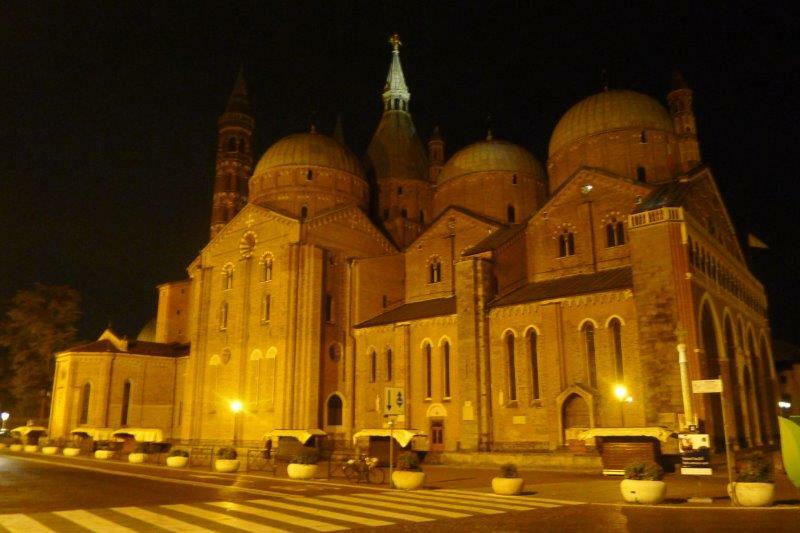 Padua is a nice small university city (210,000) only about 40 km (28 miles) to Venice. 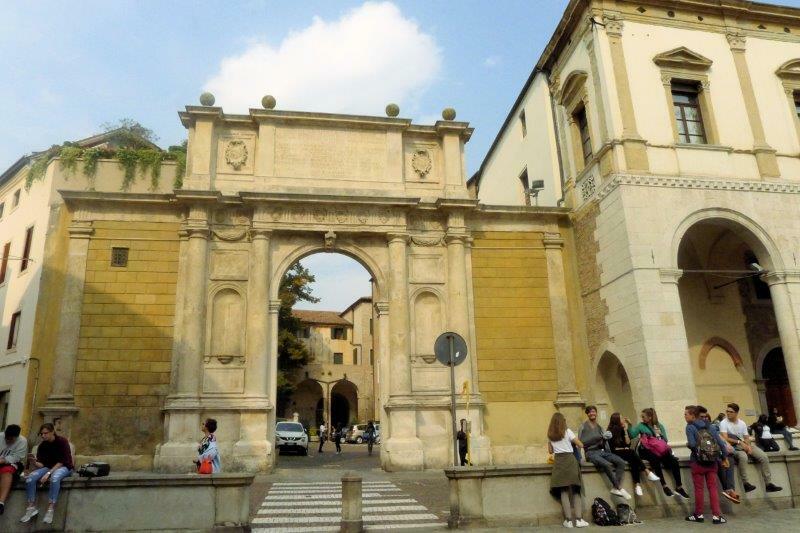 University students are everywhere from the University of Padua, founded in 1222. Galileo taught there at some point. It’s like being in Fort Collins except on small, arcaded, narrow sidewalks and streets. We had our first lesson on how to make coffee in the Moka Coffee pot. Pretty easy but not very efficient if you want to drink lots of coffee. 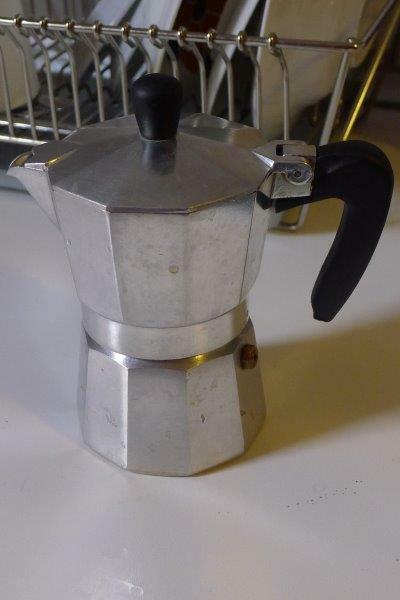 The moka coffee pot – fill with coffee and water and let it boil. 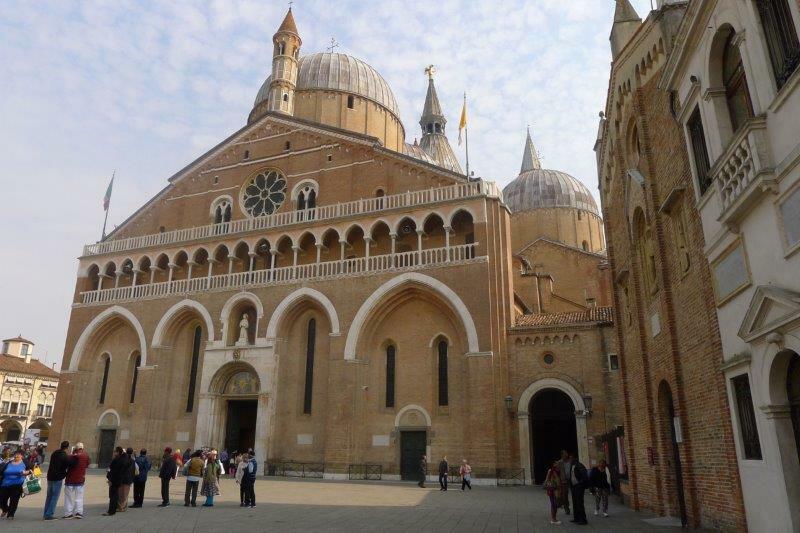 We stayed at a little apartment just up the street from the Basilica of St. Anthony where we followed an Indian tour group around in the church and eavesdropped on their Italian tour guide. St. Anthony’s body is in the church as well as a few relics. 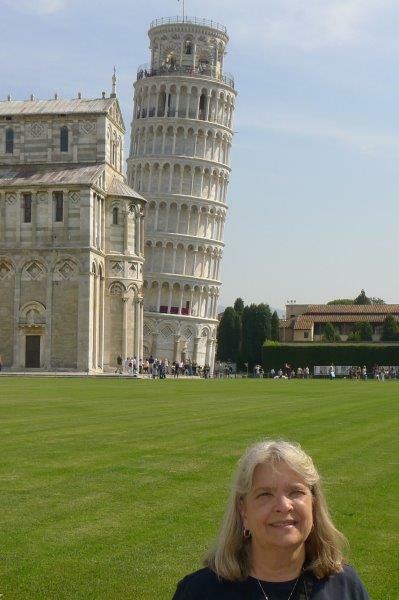 It was a Pisa sort of day and only 25 minutes from Lucca by the regional train. After walking to the Lucca train station, we needed to buy a ticket. Thank heavens, these ticket machines will actually print out a ticket! A whole bunch of us got on the train we thought we needed and a nice female train driver came to tell us that they had to switch the train to a different track and we have to get off while they do it. She kept apologizing but it was no big deal and shortly the train switched tracks and showed up again! Lots of small villages dot the train tracks along with patches of tomatoes and beehives. Towers and big houses, old and new, could be seen in the distance. 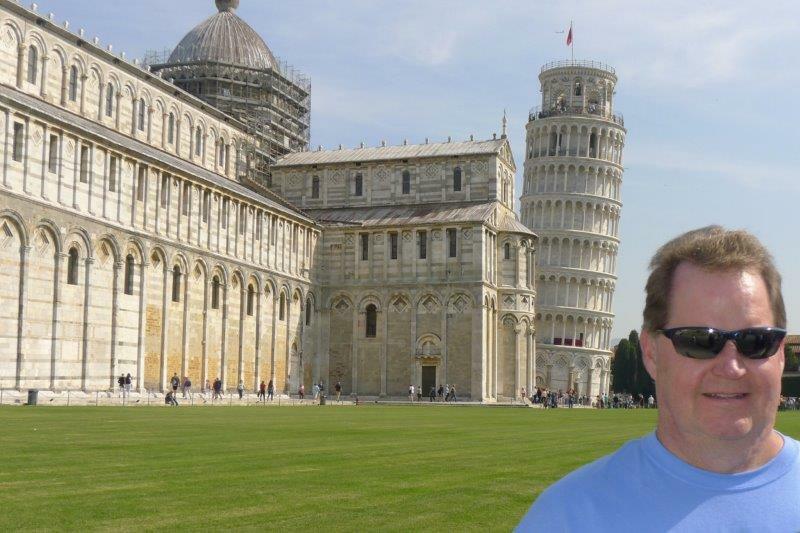 After arriving in Pisa and NOT buying a return ticket when there were no lines (more later), we walked to the Piazza de Miracoli following Google Maps and the Lonely Planet printed directions. We would have lost a bet because no signs were posted at the train station or at a big plaza giving any indication which of many streets we should choose to walk down. 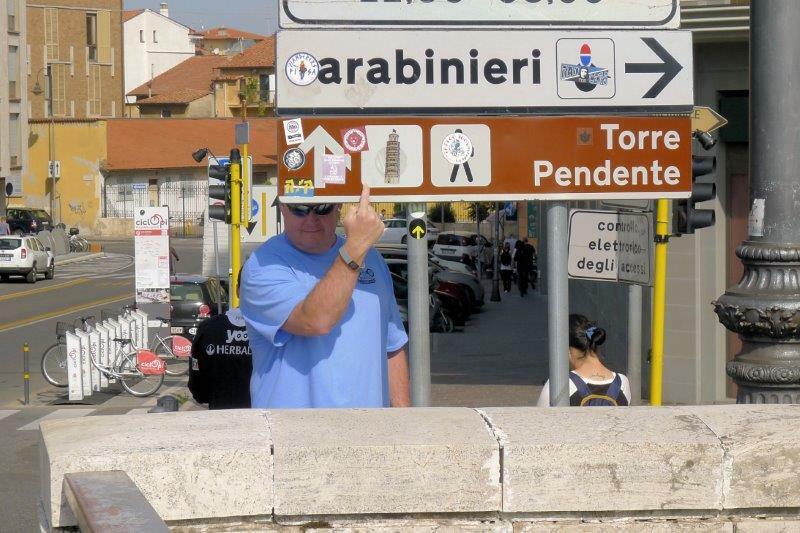 The first pedestrian sign pointing to the Tower wasn’t until we crossed the Arno River. This is the first directional sign we saw and we were pretty close to the Tower. 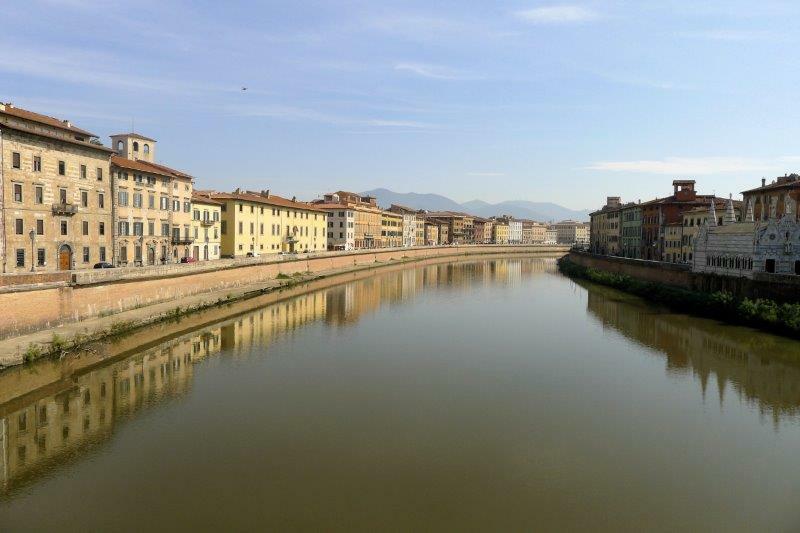 Our route took us across the river and past the U. of Pisa Law School and more churches than we could count. We stopped in one church for the obligatory visit. (No idea which church it was.) 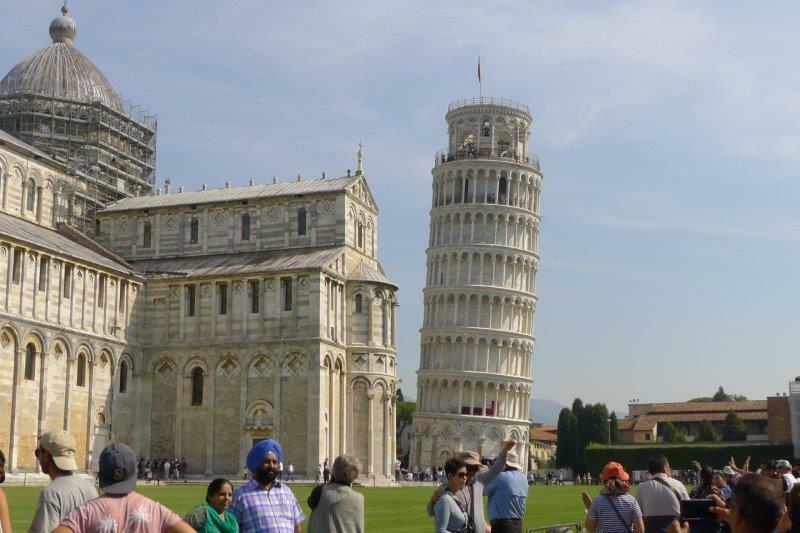 We knew the Leaning Tower was close when the number of tourists increased dramatically as well as the number of gift shops and restaurants. 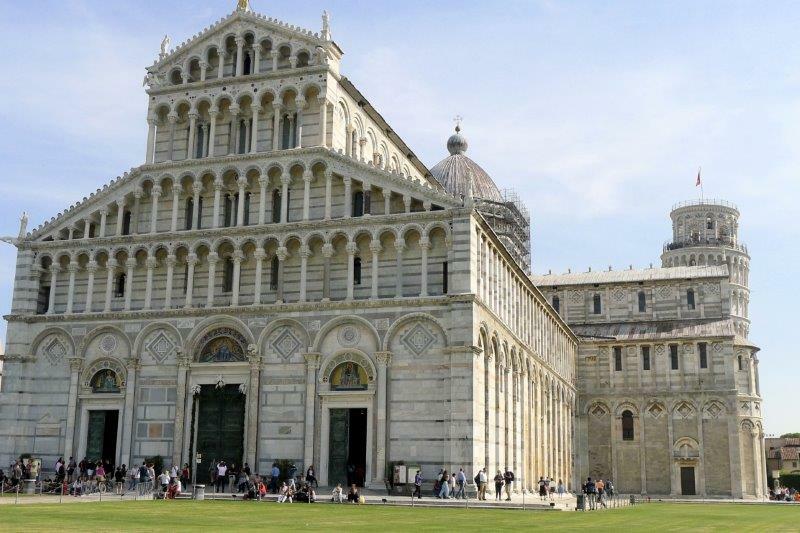 The Duomo, Tower, and Baptistry are beautiful especially in the sun. They all were bright white and, miraculously, only the Duomo still has some scaffolding on it. Mark decided we should check out the W/C. It cost .80 E and the line for the Women’s room was really long – Surprise! – but Mark just whipped in and out of the Men’s. Lots of tour groups and individual tourists, like us, so I can’t imagine what it’s like in the summer. The Leaning Tower of Pisa and the Duomo. 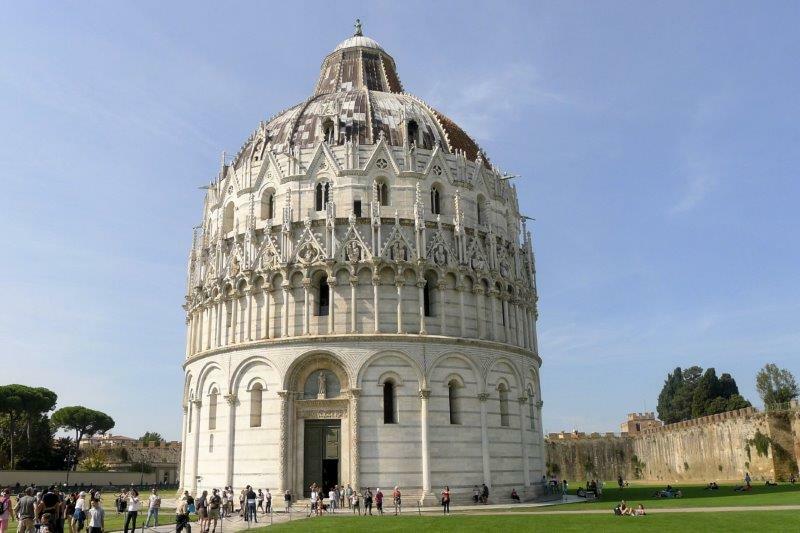 The Baptistry described as a big cupcake. 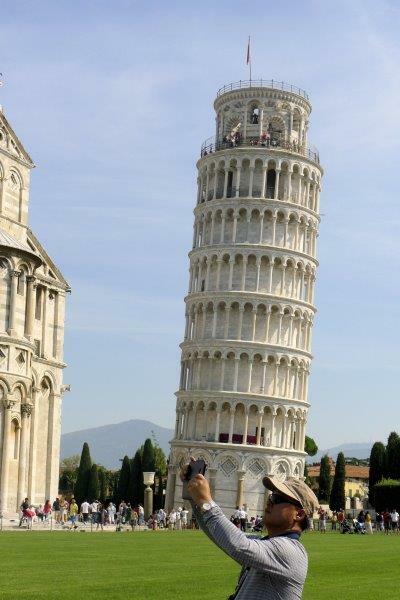 Leaning Tower of Pisa. We didn’t do any of the pics holding up the tower. We took pictures and picked up a walking map of Pisa from Tourist Information before we wandered our way through the city and the Piazzas. We didn’t visit the insides of any buildings nor climb the tower. 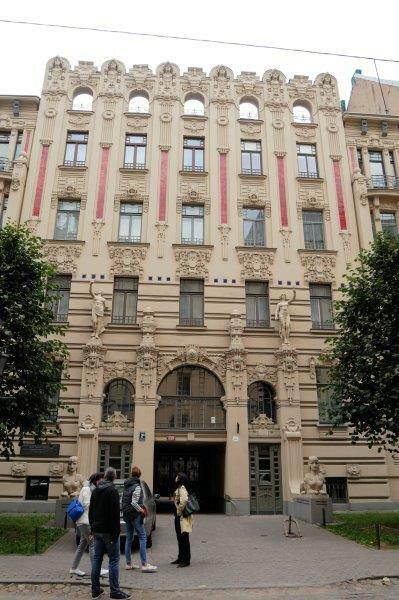 This building was in one of the piazzas on the walk back to the train station. The next challenge was getting a ticket to go back to Lucca. All of the ticket machines in the Pisa station will only issue paperless tickets so even many of the Italians had to get out of the machine line and go use the ticket office line. Of course, the non-Italians were all out of luck! We queued up in the LONG ticket line, starting out with 4 ticket sellers; reduced to 3 when one of them served a guy and hung his “Closed” sign. The line actually went pretty fast but Mark and I just commented “Full employment”. We think Lucca machines sell tickets because the ticket counter closes at 8:05 PM. 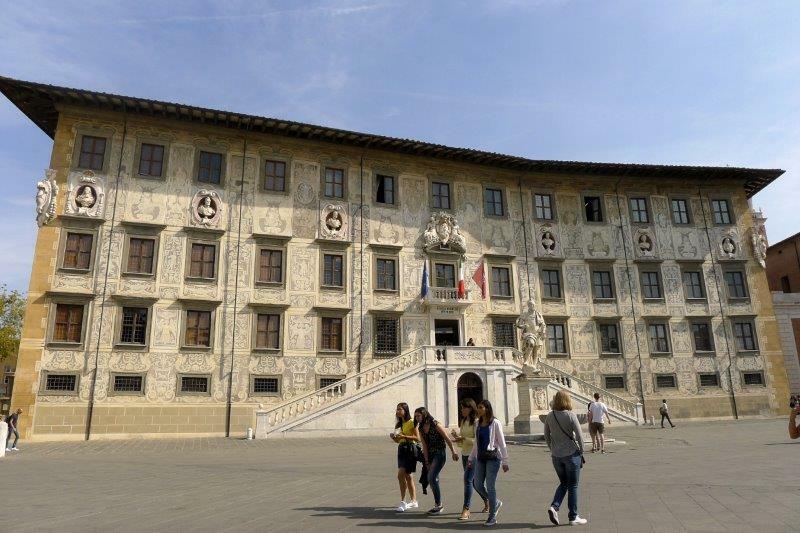 Pisa summary – Ok for one visit but not someplace I’d go back to. 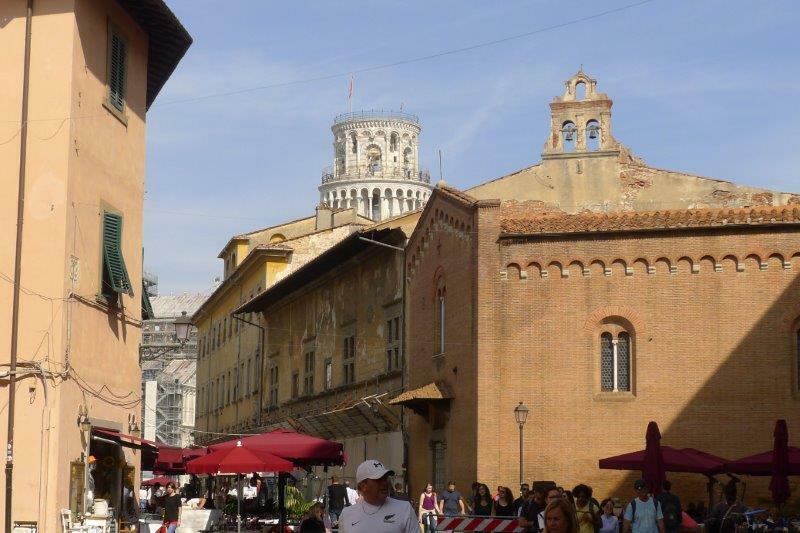 Pisa is a pretty busy city and didn’t impress us enough to want to return for another visit. We’re finished with the family visits after 5 days in Cumberland, MD with Susan’s Mom. 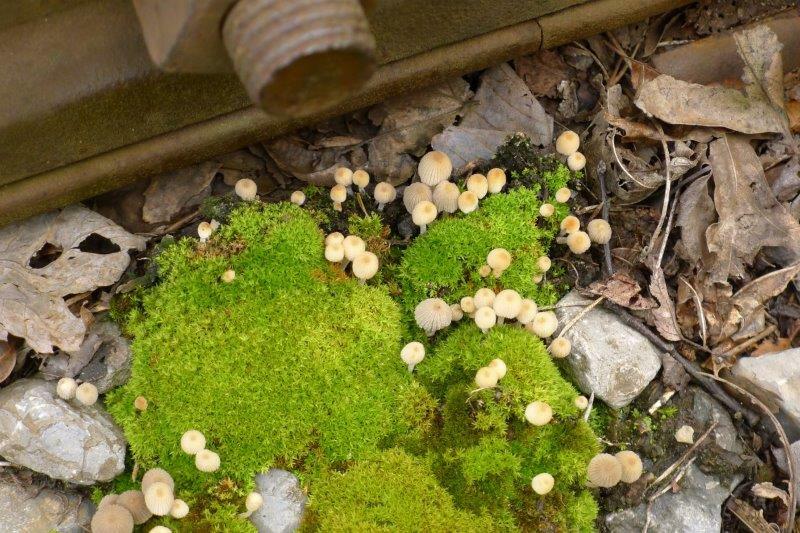 We went exploring and found the Great Allegheny Passage and used it for 2 days of walks. It’s a biking/walking trail that runs from Pittsburgh to Cumberland, following a rail line. Walking in 2 different directions, we found the Brush Rail Tunnel and the Cumberland Bone Caves where prehistoric bones were found about 100 years ago. 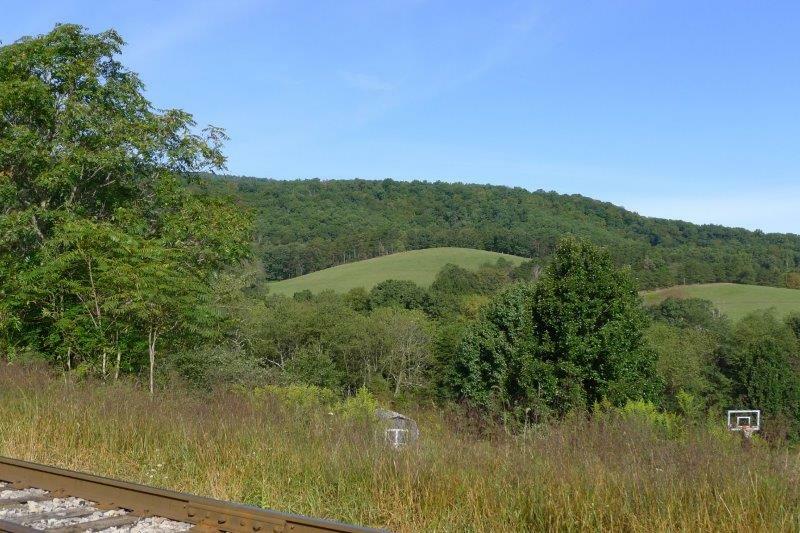 Western Maryland is full of eastern mountains – highest point is about 1600 feet. It’s very green and full of trees. 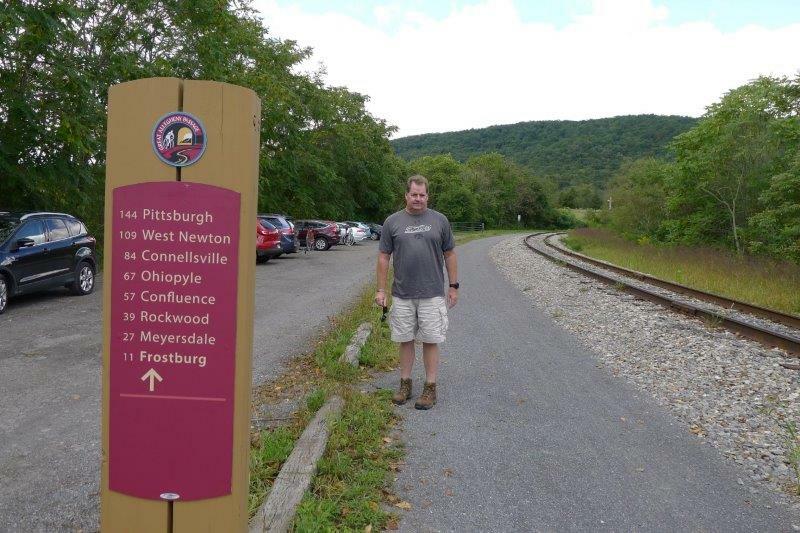 Mark at the start of our walk on the Great Allegheny Passage. We didn’t walk all the way to Frostburg! 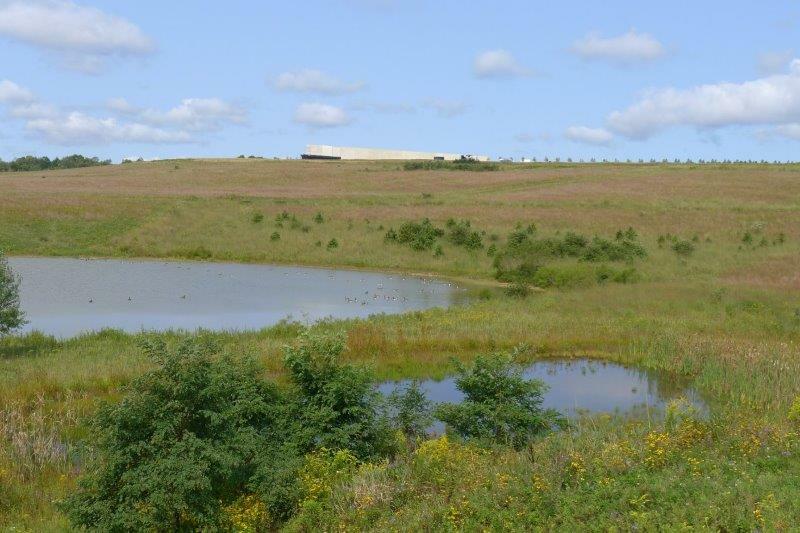 On 9/10 we drove over to Shanksville, PA to visit the Flight 93 9/11 Memorial. 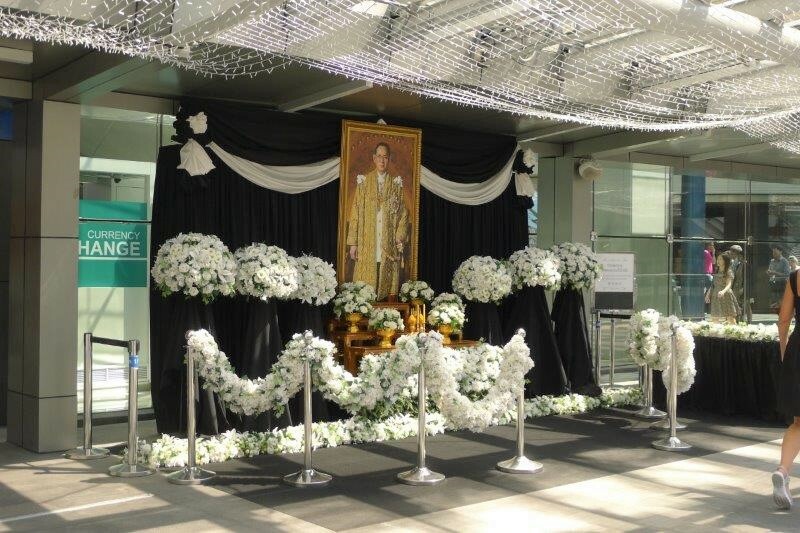 It’s a very quiet, peaceful place and very moving. I needed a few tissues as we toured the Visitor Center and walked down to the Memorial Plaza where there’s a huge panel for each of the 40 victims. 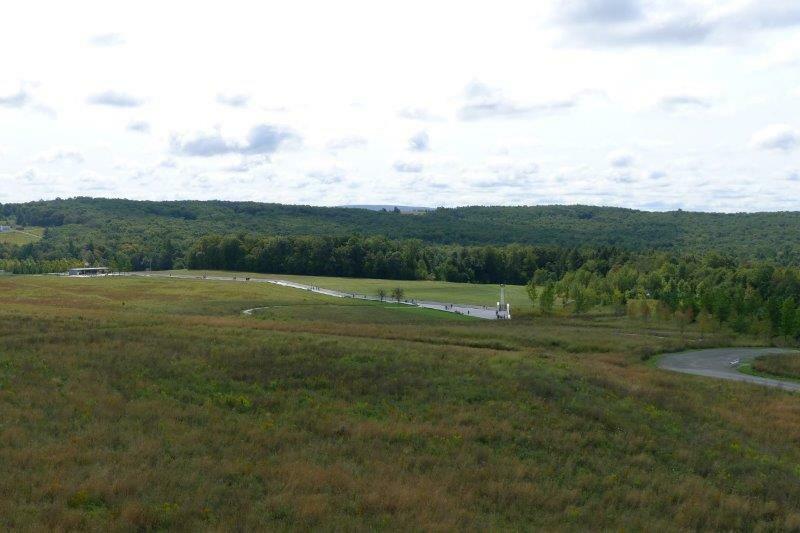 Looking down on the Flight 93 Memorial Plaza from the Visitor Center. We like to keep up on events that might impact our travels around the world and we use a number of different sources. The most well-known one in the U.S. is the U.S. State Department. They publish information about travel in many counties. The topics include information on passports, Alerts and Warnings issued for each country, visas needed to enter the country, crime, driving conditions, etc. I think the State Department tends to be very conservative relative to the U.K. and Australia but it’s a good place to start. The State Department also runs a program for Americans called Smart Travel Enrollment Program (STEP) to enroll your international trips. After enrollment, you are connected with each Embassy and they will send alerts, if necessary. If you want another take on security around the world, you can sign up with the U.K. Foreign Office to get alerts as they are issued. Go to www.gov.uk/foreign-travel-advice and enroll in “Get Updates” via email. You can choose the countries you need alerts for. I really like that the U.K. even gives information on possible travel problems due to soccer matches and other events like this. You can tell where football/soccer ranks in importance there! One of my favorite information sources is run by United Health Care Global. Sign up for “Daily Security Alerts” and every day the alerts will show up in your email box. In addition to the “normal” crime, terrorism, and political activities, this groups publishes information about a wide variety of strikes also that can definitely have an impact on your travel – taxi strikes in Italy, rail strikes in the U.K., airline and airport strikes, etc. – as well as a list of holidays around the world. Can anyone say “Closed Museums”?? I’m on the hunt for 1 million miles on United Airlines after joining their Frequent Flyer Club when it first started in about 1981. Mark already has 1 million miles so I can be his designated Premier Gold partner but it’s the principle of the matter. I want my own Million Mile designation! 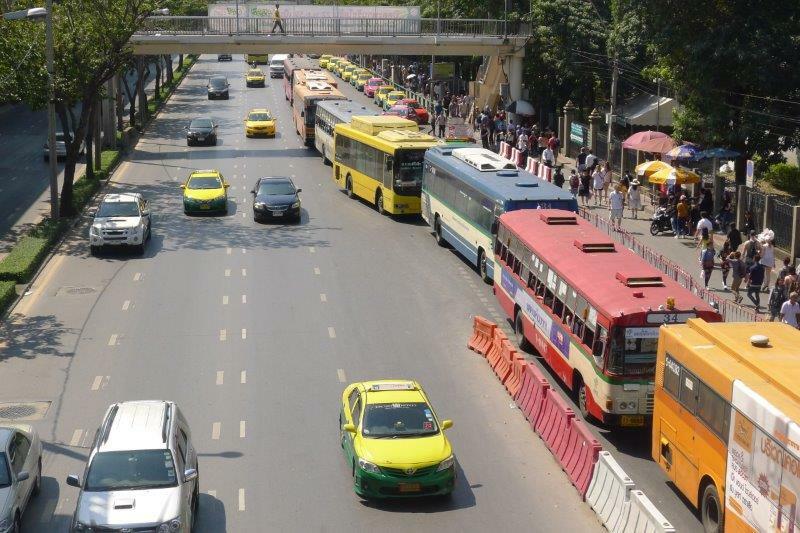 View from the Mo Chit BTS stop for the Weekend Market in Bangkok – cabs and buses! 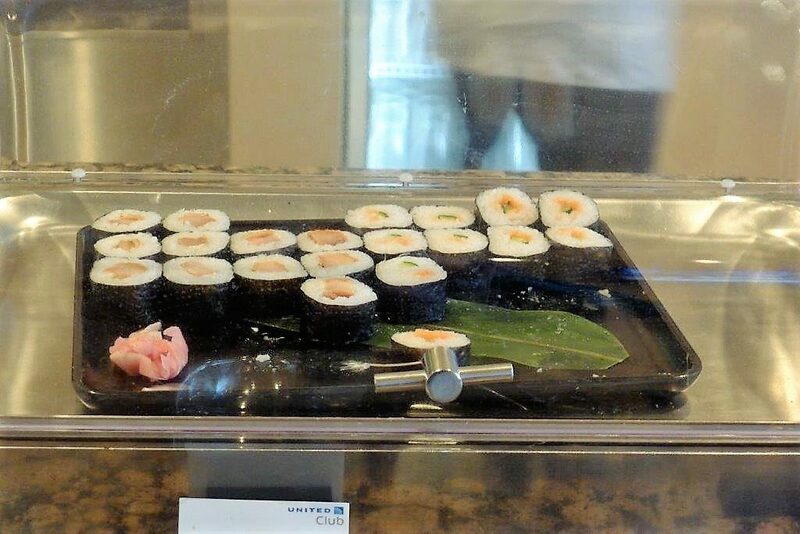 Sushi in the United Airlines Club at Tokyo Narita airport. 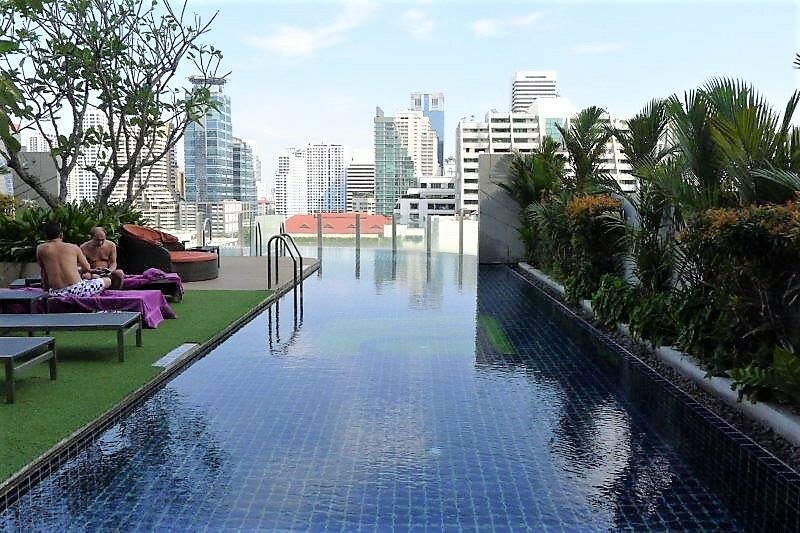 You won’t find this in the U.S. United Clubs.